Oswald Achenbach (2 February 1827 - 1 February 1905) was a German painter associated with the Düsseldorf school of painting. Though little known today, during his lifetime he was counted among the most important landscape painters of Europe. Through his teaching activities, he influenced the Kunstakademie Düsseldorf. 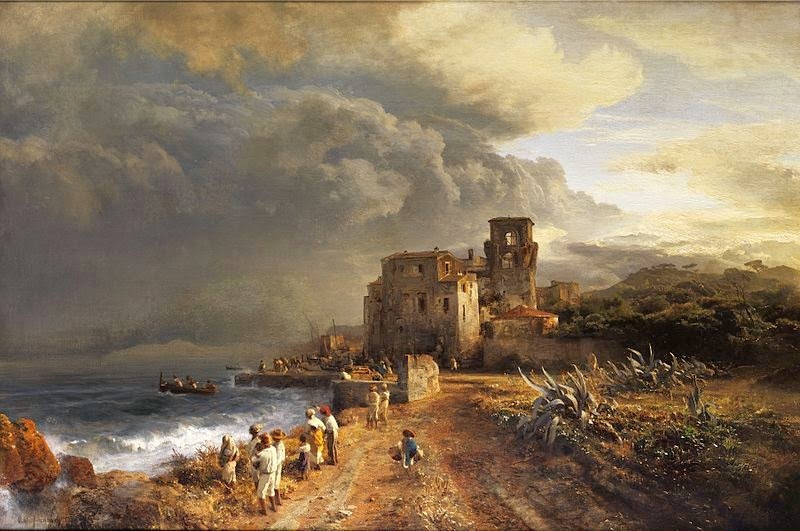 His brother, Andreas Achenbach, who was twelve years older, was also among the most important German landscape painters of the 19th century. 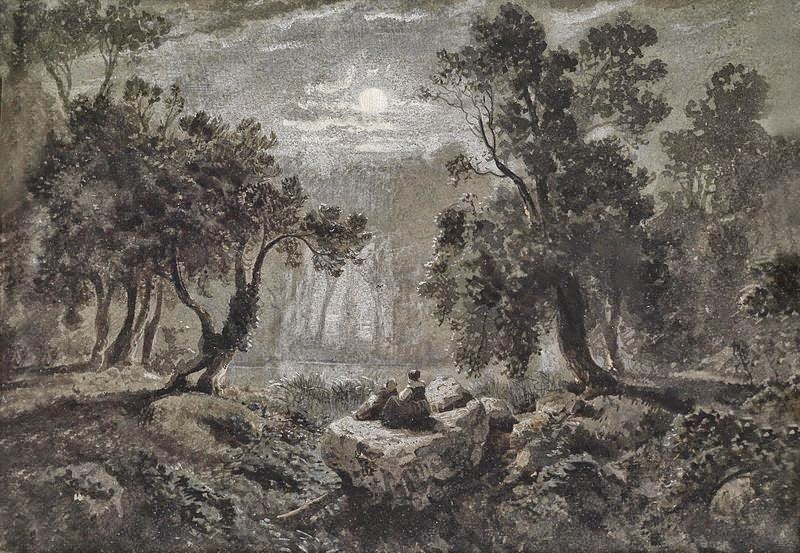 The two brothers were humorously called "the A and O of Landscapes" (a reference to their initials matching a common German reference to the Alpha and Omega). Oswald Achenbach was the fifth of ten children. His parents were Herman and Christine (née Zülch). There was little about the family to suggest that it would produce two of the century's most important painters. Hermann Achenbach was employed in a series of jobs, including beer and vinegar brewer, guesthouse owner, and bookkeeper. During Oswald's early childhood, the family moved to Munich where he attended primary school for at least a short period. At exactly what point his family returned to Düsseldorf is not known. In 1835, at the age of eight, Achenbach was enrolled in the elementary class of the Kunstakademie Düsseldorf (Art Academy). This was technically in violation of the Academy's bylaws, which required a minimum age of twelve. He continued there until 1841. He was a student in the elementary class, where he was instructed in the basics of drawing, and then spent a year in the architecture class. This also did not correspond to the normal curriculum as described in the bylaws. The reasons for Achenbach's treatment are not fully known. Possibly, the bylaws were in practice mere guidelines and exceptions were made often, or perhaps only for highly gifted students like Achenbach. 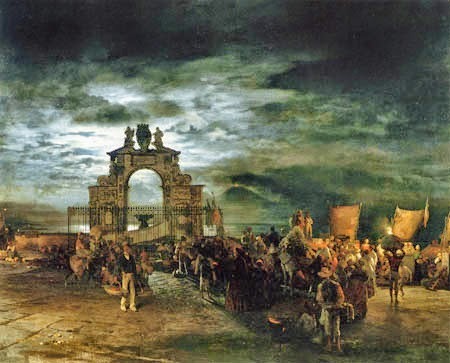 It is also not clear why Achenbach left the Academy in 1841. From his sketchbooks, we know that during this period he had undertaken intensive nature studies in the area around Düsseldorf. 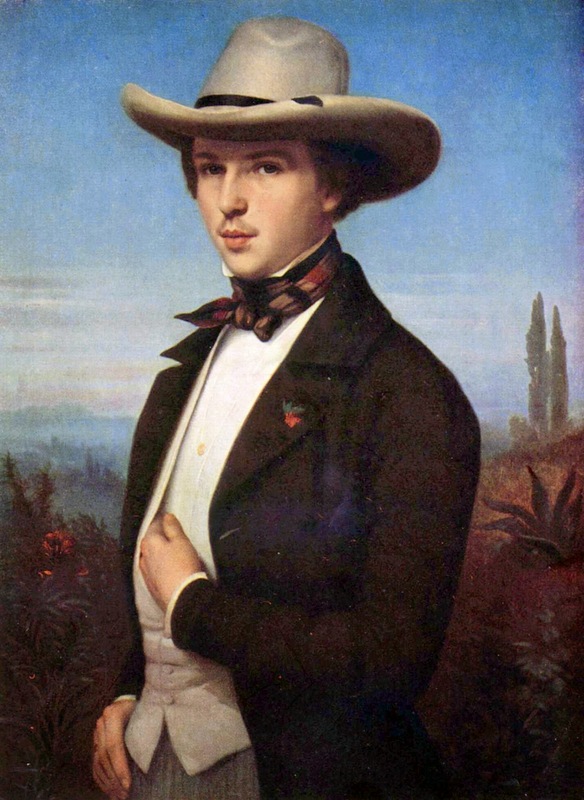 In 1843, the sixteen-year-old Achenbach began a journey of several months through Upper Bavaria and North Tyrol during which he continued his nature studies. 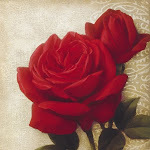 His earliest known works in oil also come from this period. In 1845. 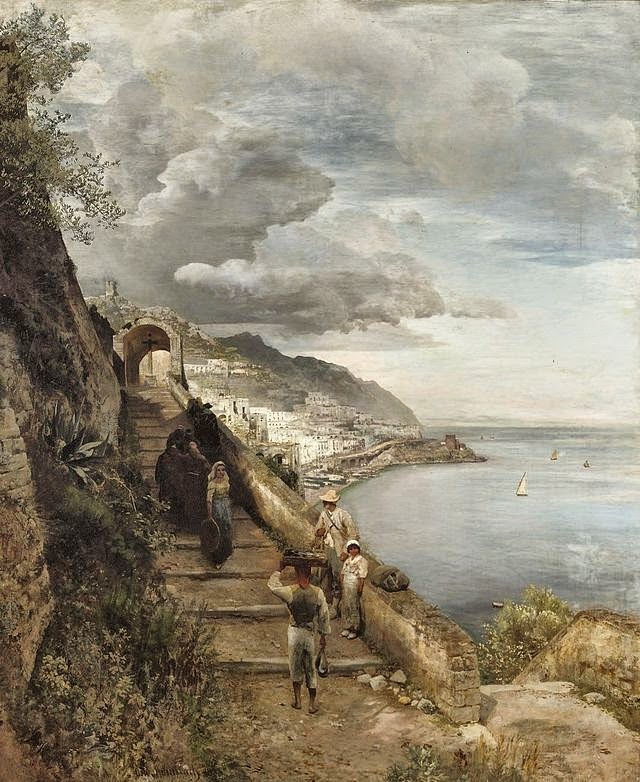 Achenbach undertook a journey with his friend and later student Albert Flamm to northern Italy. 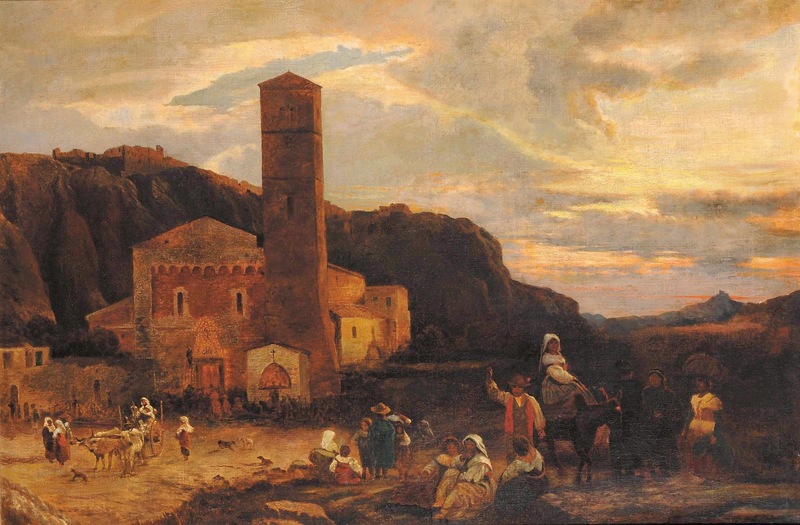 The paintings that Achenbach completed from this period predominantly consist of Italian landscape motifs. 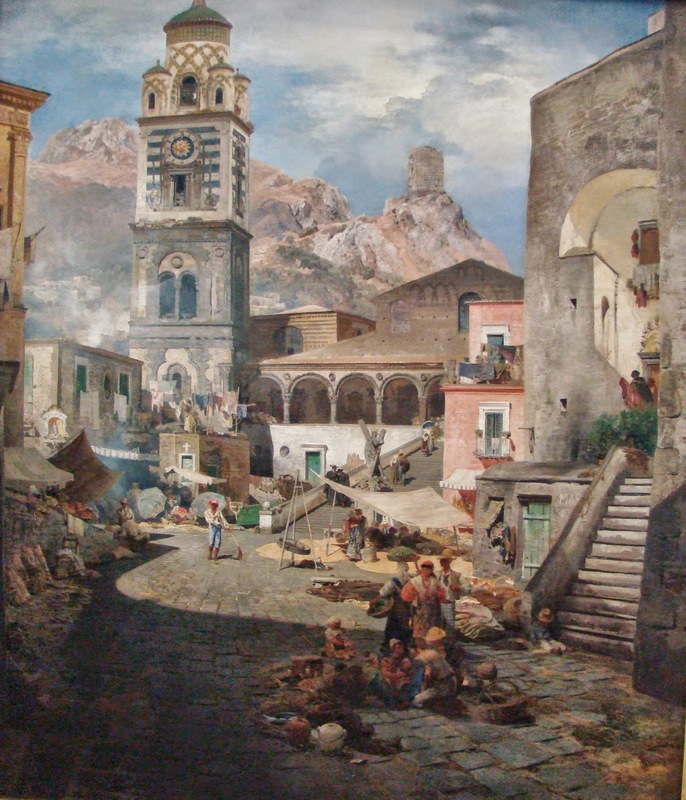 Few of Achenbach's paintings from before 1850 survive today. However, those that do indicate that his early choices of subject matter and technique were heavily influenced by the ideas being taught at the art academies of the time. 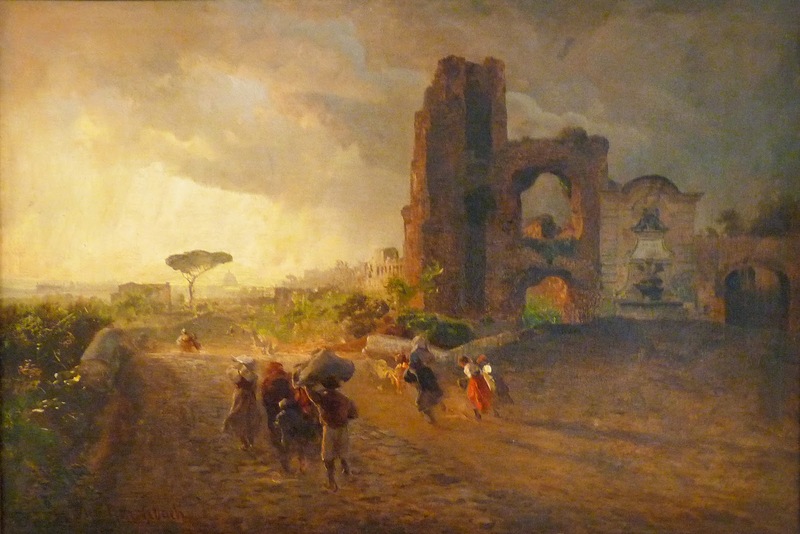 The influence of Johann Wilhelm Schirmer and Carl Rottman can be seen in these paintings. 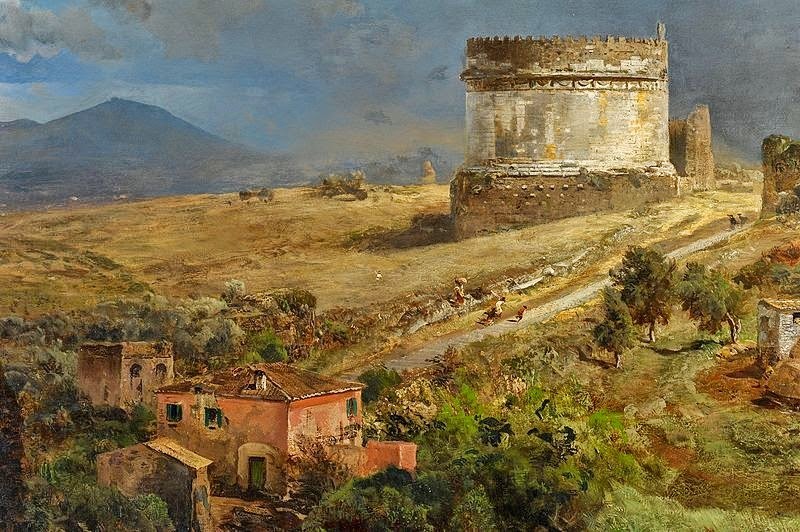 In the oil studies that Achenbach completed during these trips, he adhered very closely to the landscape and concerned himself with the details of the typical Italian vegetation. Architectural motifs and figures play a much smaller role than the would in his more mature work. Until well into the 19th Century, artistic education in Germany and much of Europe was strongly influenced by the "Kunstakademien", or art academies. However, particularly in the 19th century, these academies had become extremely formal and rigid and were not very responsive to new artistic directions. The academies also organized the big art exhibitions, through which artists primarily sold their work. Artists whose styles were opposed to the ideas of the academies were not exhibited and therefore generally had very few opportunities to sell their work. 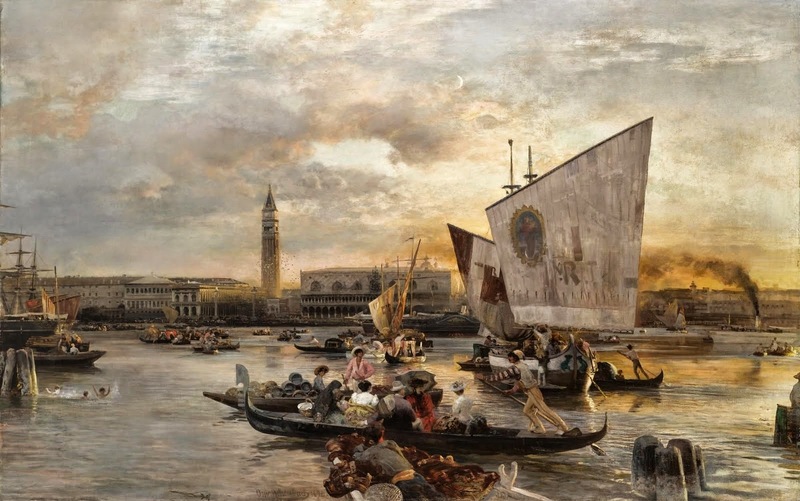 At the beginning of the 19th century, individual artists and representatives of entire artistic movements began to stand in opposition to the culture and concepts of the Academies. Achenbach was one of the artists who opposed the Kunstakademie Düsseldorf and became an early member of two Düsseldorf associations, which many like-minded artists had joined. The first was the "Association of Düsseldorf Artists for Mutual Support and Help" and the association "Malkasten" ("Paintbox") which was founded on 11 August 1848 with Achenbach as one of the original signatories of the founding document. These Associations jointly staged plays, organized music evenings and put on exhibitions. 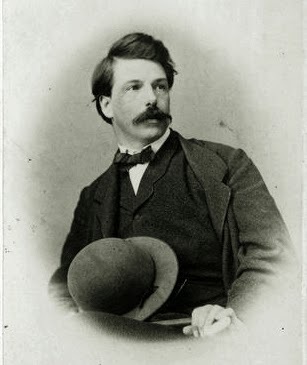 At many events, Achenbach took an active part, directing, playing or staging plays. 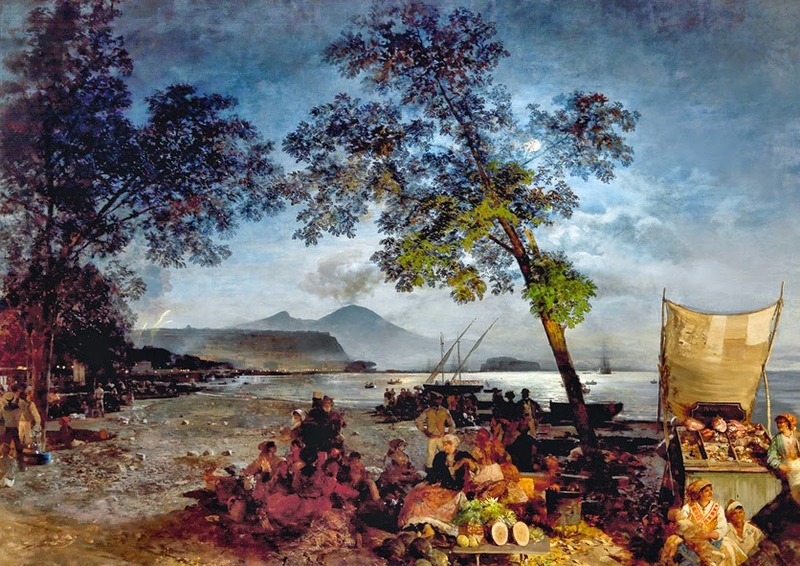 Achenbach was particularly attached to "Malkasten" and remained connected with it until the end of his life. In 1850, his paintings were displayed in the exhibitions of the newly founded Düsseldorf gallery of Eduard Schulte. 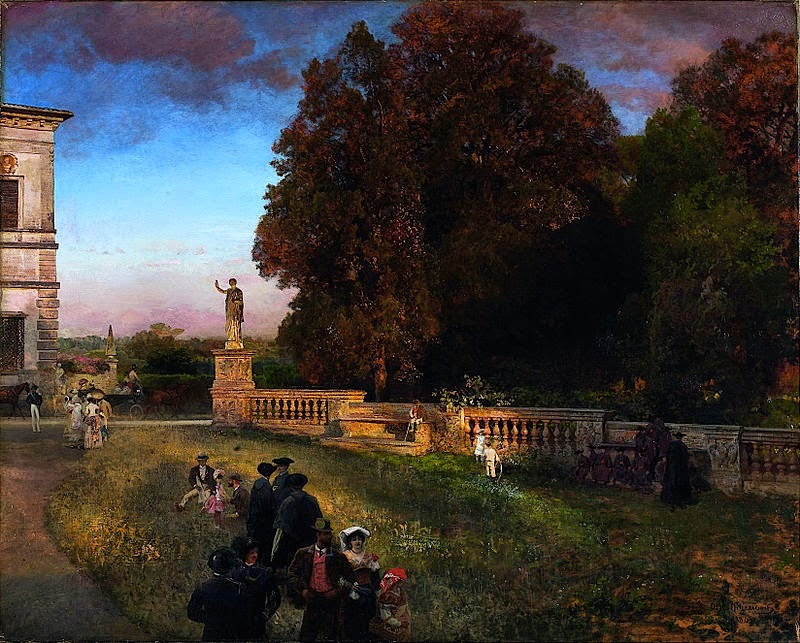 Schulte's gallery showed the works of artists who were independent of the Academy and played an important role in Achenbach's early economic success. It developed into one of the leading German galleries and later established branches in Berlin and Cologne. 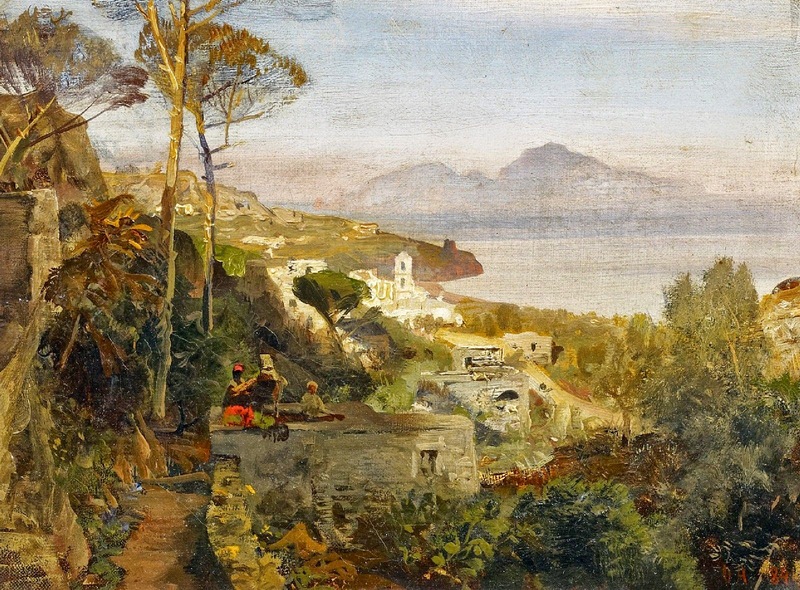 In the summer of 1850, Achenbach undertook a trip to Italy, including Nizza, Genoa, and Rome. 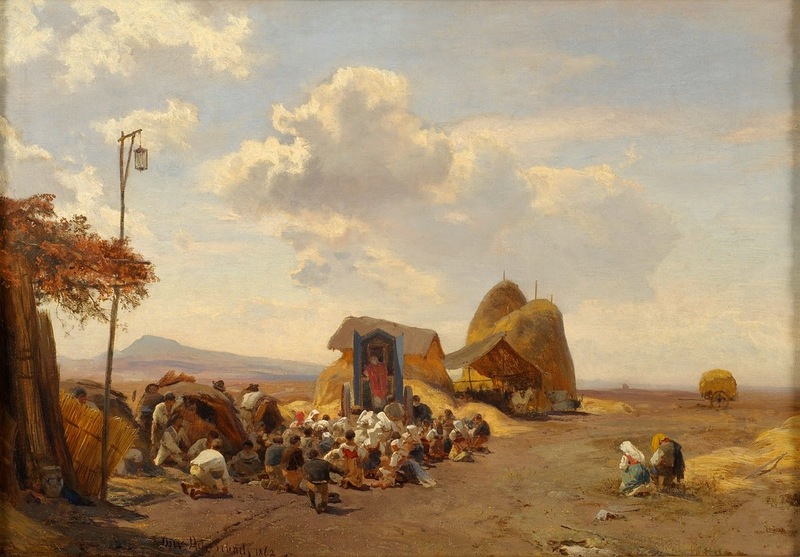 Together with Albert Flamm, he traveled from Rome into the surrounding countryside and visited the areas where earlier landscape painters had been inspired. 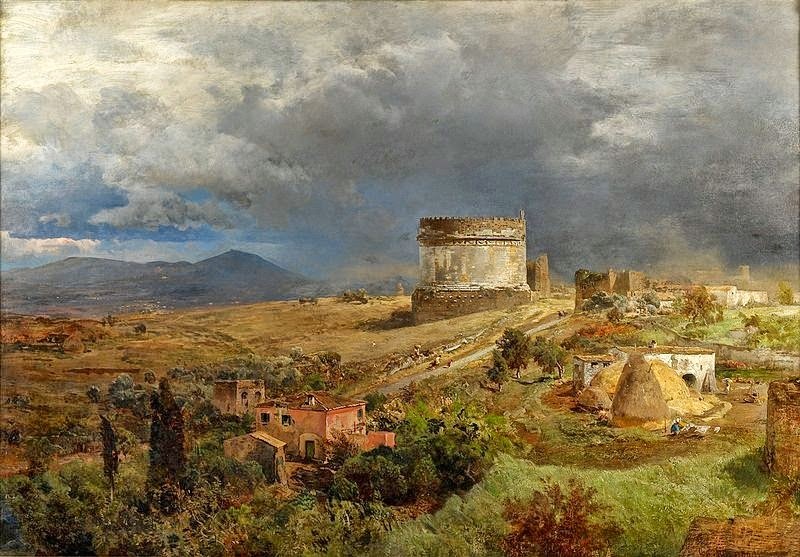 On the trip he got to know a number of other painters better, including Arnold Böcklin, Ludwig Thiersch and Heinrich Dreber with whom he spent a long time in Olevano. 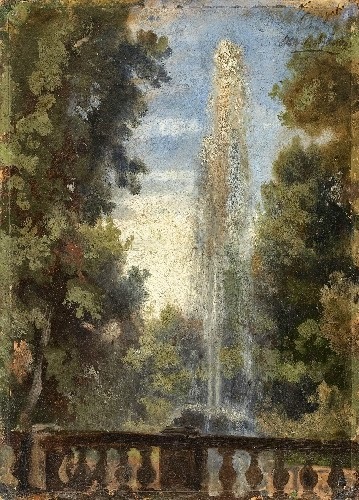 Thiersch once commented how differently the artists processed their impressions of the landscapes: Dreber drew elaborate pencil sketches, Böcklin simply let himself experience the environment and recorded relatively little in his sketchbook, while Achenbach and Flamm both painted oil studies outdoors. 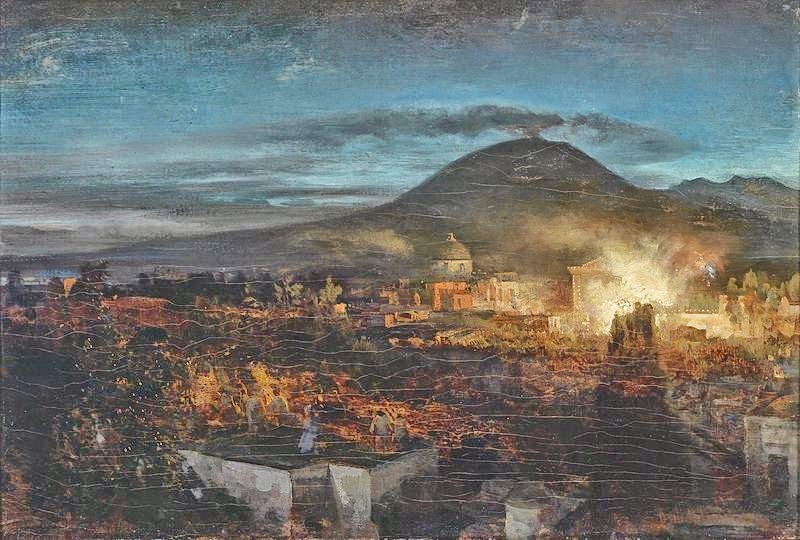 Achenbach's surviving studies show that he was not overly interested in details but concentrated on the characteristic colors and forms and the distribution of light and shadow. He focused on his color impressions, setting layers of paint in different thicknesses over one another to find the desired tone. On 3 May 1851, Achenbach married Julie Arnz, to whom he had been engaged since 1848. She was the daughter of a Düsseldorf publisher, who published, among other periodicals, the Düsseldorf Monathefte and the Düsseldorf Monatsalbum. Achenbach contributed to both of these with lithographs of his paintings, sketches, and other works. At the same time he began to take his first students. Between 1852-1857 the couple had four daughters, followed by a son in 1861. Achenbach's son, Benno von Achenbach, would be an important innovator in the equestrian sport of combined driving and was ennobled for his contributions thereto by Wilhelm II. 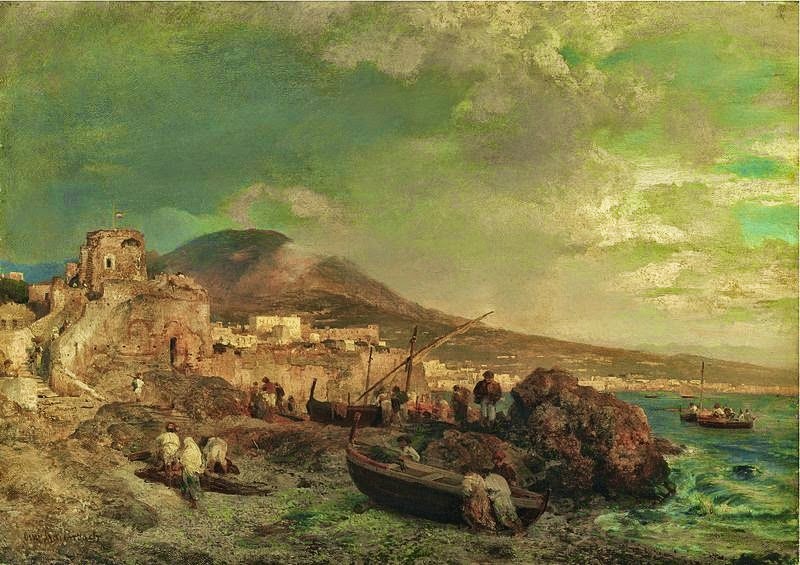 By this time, Achenbach's painting was already well-known internationally. In 1852, at 25, the Art Academy in Amsterdam had admitted him as a member. Several of his works were displayed the Exposition Universelle of 1855 and were very well received. In 1859, he was honored with a gold medal at the Salon Exhibition in Paris. In 1861 he was granted an honorary membership to the St Petersburg Academy and in 1862 from the Art Academy of Rotterdam. After 1860, his technique underwent a change into what is considered his mature style. The paintings were more tactile, the paint was applied with more texture and the brushstrokes were less dependent on the subject matter represented. 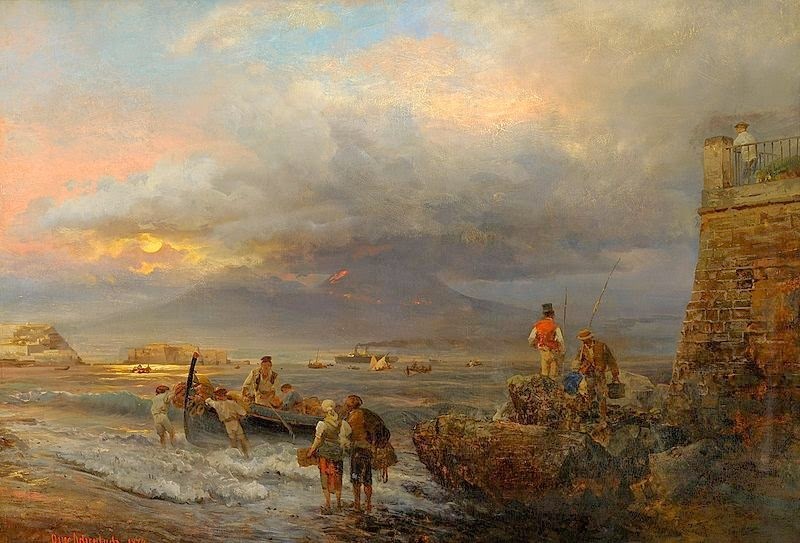 In parts of some paintings, Achenbach increasingly dispensed with detailed figures. This change in technique may have to do with the influence of Gustave Courbet. 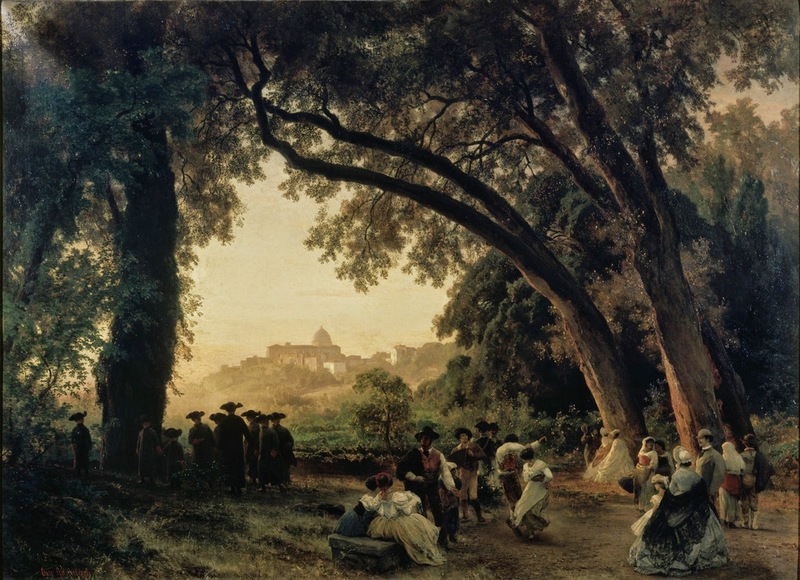 His favorite subjects continued to be Italian landscapes and peasant scenes, which he enhanced and idealized with his lighting. In March 1863, Achenbach became the Professor for Landscape Painting at the Kunstakademie Düsseldorf. Accepting it represented a social elevation and also financial security. It also appears to be in contradiction to his earlier opposition. However, since Friedrich Wilhelm Schadow had left the office of Director in 1859, the conflicts both within the Academy and also between the Academy and the independent artists had diminished. 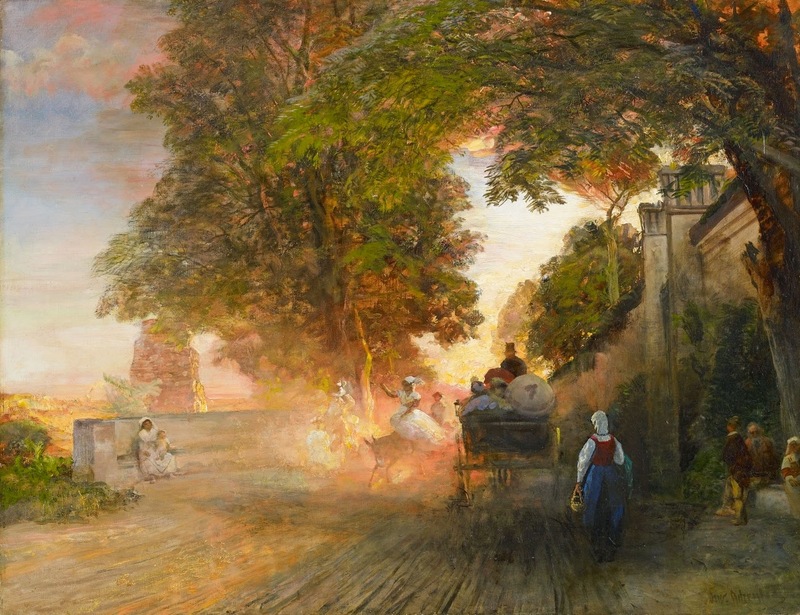 The appointment of Achenbach to a position was a conscious political decision reflecting the new direction of the Düsseldorf Academy, to bring about a conciliation with the independent artists. 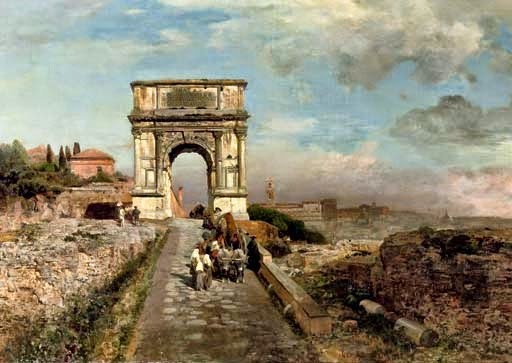 In the same year, Achenbach was named a Knight of the Legion of Honor by Napoleon III and from 1863 to 1868 his painters were shown at the Salon in Paris. Alongside the Order of Guadelupe from Emperor Maximilian I of Mexico i 1866 and the Knights Cross, First Class from the Order of St. Michael from the jury for the International Art Exhibition in Munich in 1869, this was among the greatest honors hof his career. 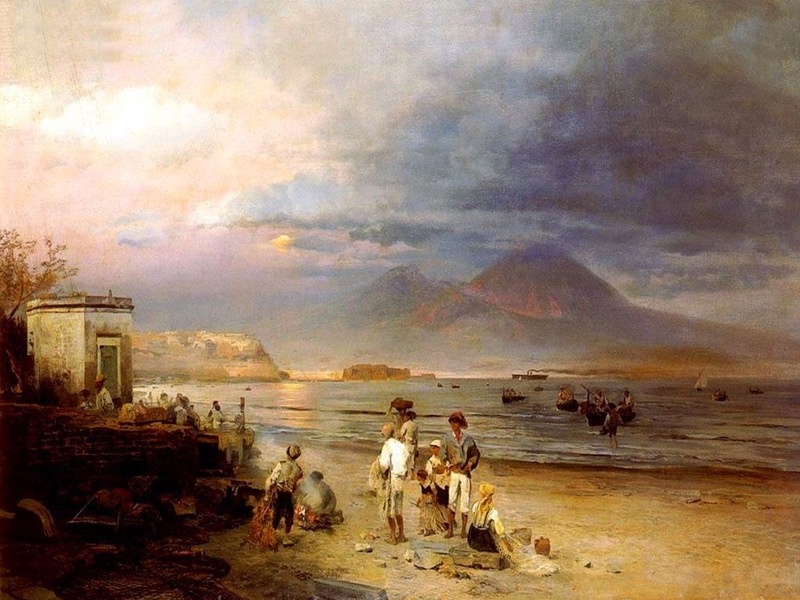 Such recognition for artists during this period was not uncommon, but they contributed significantly to Achenbach's fame, confirmed his recognition as an artist and were important for his commercial success. 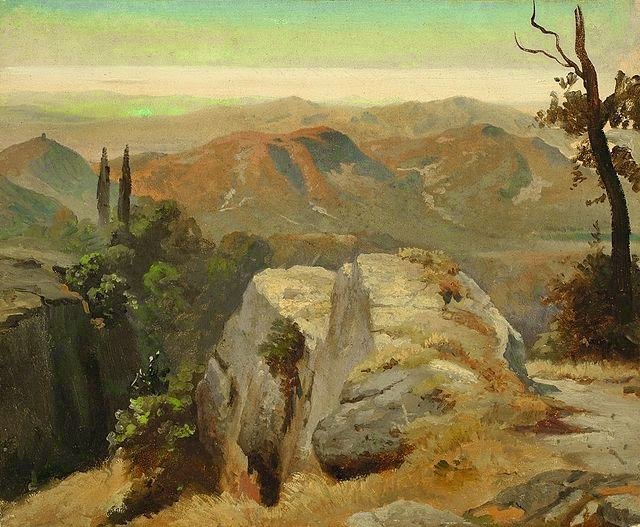 Achenbach followed Hans Gude as Professor of Landscape painting at the Academy. 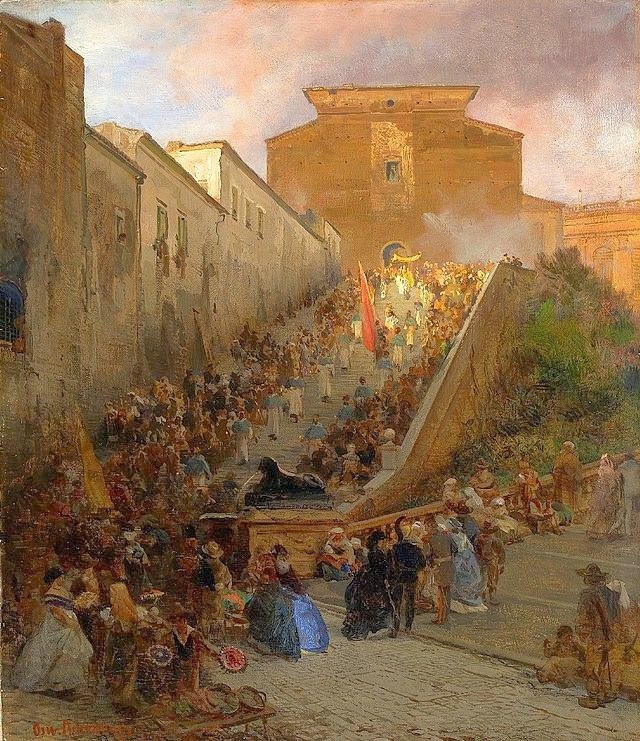 After 1866 he taught one of the highly regarded "Master Classes". Among his most well-known students are Gregor von Bochmann, Arthur Calame, Themistokles von Eckenbrecher, Arnold Forstmann, Theodor Hagen, Louis Kolitz, Ascan Lutteroth, and Karl Seibels. To his students, he emphasized above all the decisive role of light and dark for the composition of paintings. For him it was more important than the choice of subject. Consequently he advised his students to familiarize themselves with the paintings of J.M.W. Turner. He also recommended the works of his brother Andreas. During his professorship, Achenbach continued to undertake many trips. These included long stays in the Teutoburg Forest and Switzerland. 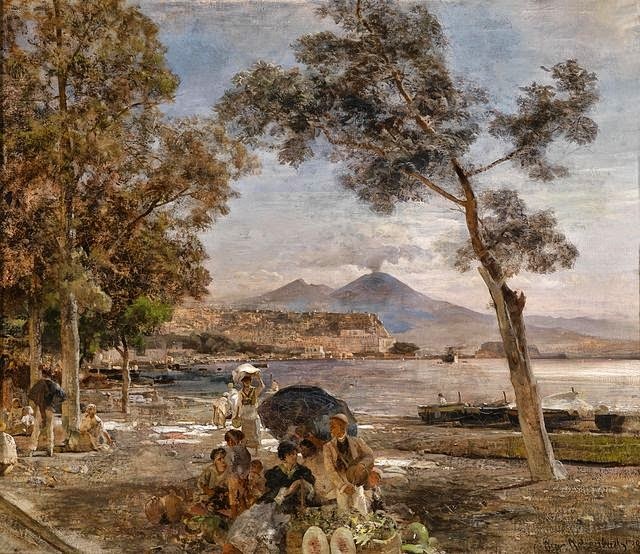 In 1871 he and his family spent almost nine months in Italy, including Castellammare di Stabia, Amalfi, Capri, and Ischia, and several weeks in Sorrento. During this time Theodor Hagen and Albert Flamm took his place at the Academy. After 1860, his technique underwent a change. The paintings were more tactile, the paint was applied with more texture and the brushstrokes were less dependent on the subject matter represented. 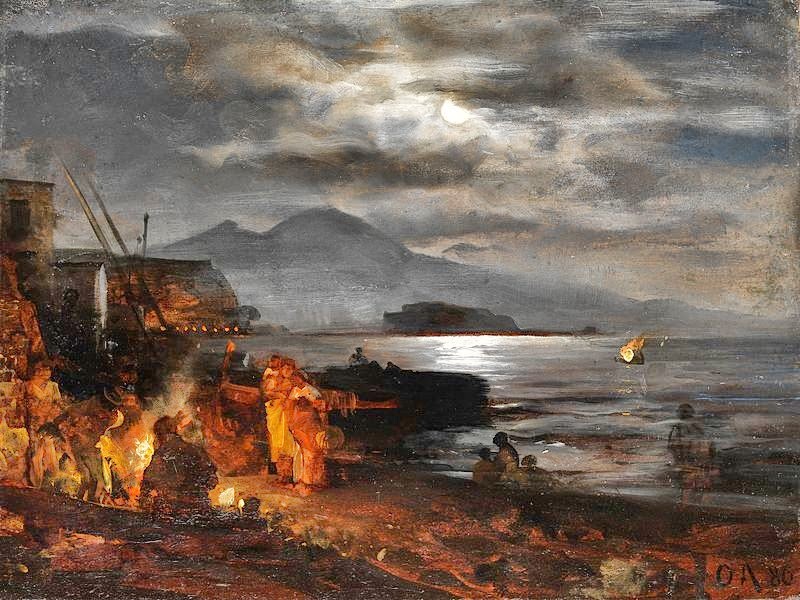 In parts of some paintings, Achenbach increasingly dispensed with detailed figures. This change in technique may have to do with the influence of Gustave Courbet. 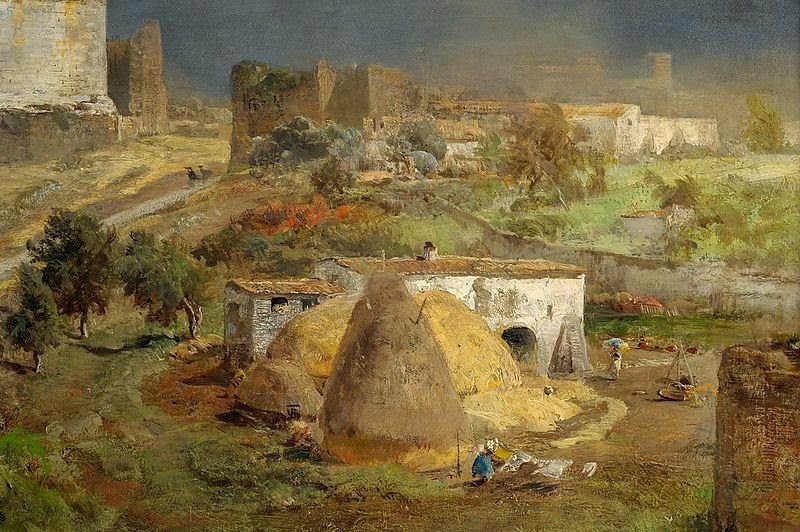 His favorite subjects continued to be Italian landscapes and peasant scenes, which he enhanced and idealized with his lighting. Achenbach gave up his professorship at the Institute in 1872. He had submitted his resignation once before, in 1869 but withdrew it. 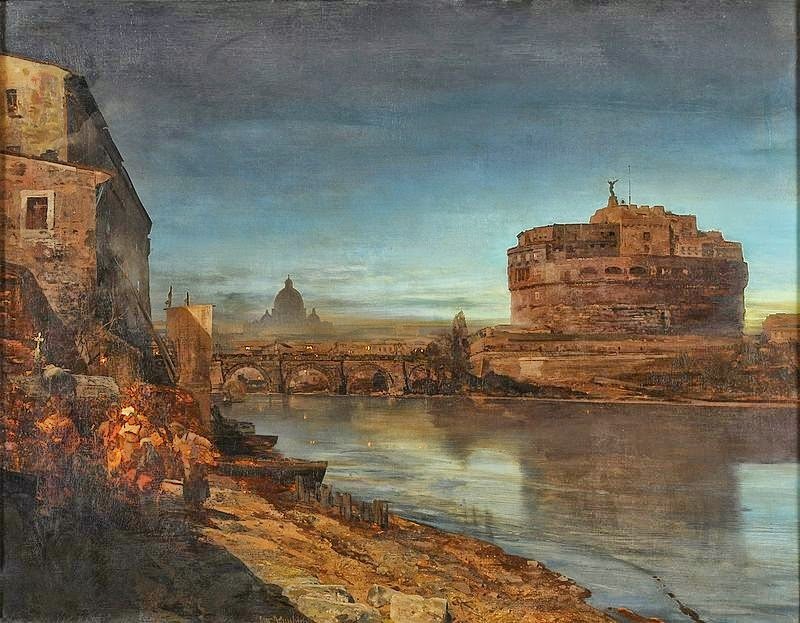 Achenbach had felt that his teaching constrained his own artistic work. In the following years, Achenbach made numerous trips. 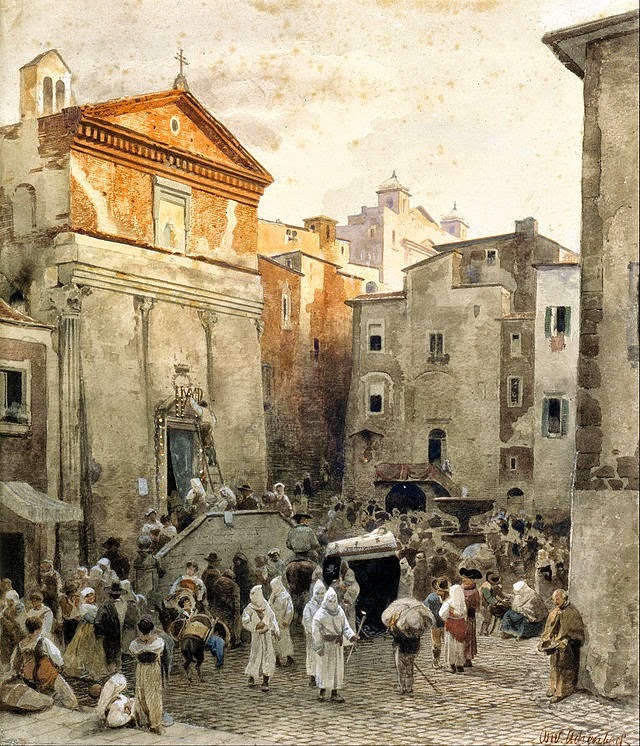 The last big trip to Italy began in early summer 1882 and he visited Florence, Rome, Naples, and Sorrento. In 1884 and 1895 he took trips to Northern Italy. He had planned a trip in 1897 to Florence, but canceled it due to illness. In 1897 Achenbach was made an honorary citizen of Düsseldorf in recognition of his over 50 years of engagement in various Düsseldorf institutions and associations. For many years he had been one of the leading personalities in the city. This high social position had also involved a very large and ostentatious house where he hosted artists, writers, scholars, military officers and members of the nobility. Among his most prominent guests and patrons was Karl Anton, Prince of Hohenzollern. Running such a household was expensive and necessitated Achenbach to produce many paintings. As a well-recognized artist, it was easy for him to find buyers. The larger number of his paintings, led to repetitions in the subject matter and motifs. As early as the 1860s reviewers accused him of "painting to death" certain subjects. As in his oil studies in the 1850s, in his later works Achenbach built colors up additively, using the brush, palette knife, and his fingers. He also used the texture of the canvas as a design element. In some works, surfaces that are uniformly and carefully painted with a fine brush stand next to places where the painting surface shows through or the paint is piled high, giving some works a distinctly noticeable texture. 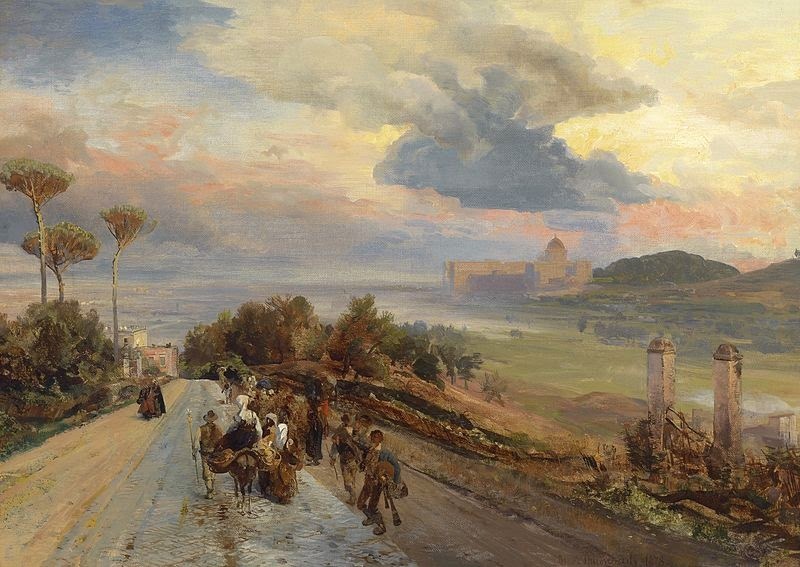 Another feature of Achenbach's late work is that the level of detail does not decreat continuously with the perspective, but rather reflects his aims for the overall effect of the painting. Furthermore, while his earlier paintings, the colors were subdued and dominated by the overall tone, in later works, accentuated contrasts play an important role. Finally, pastel colors become more common in his paintings from the mid 1880s, while in his early works, browner tones dominated. Achenbach died in Düsseldorf on 1 February 1905, on day before his 78th birthday. He was buried in the North Cemetery in Düsseldorf, where is grave is preserved to this day. During his education, Achenbach was never actually a student of Johann Wilhelm Schirmer. However, has an artist who spent the greater part of his life in Düsseldorf, he nevertheless had many opportunities to study his paintings. In Achenbach's paintings from the 1840s and early 1850s, Achenbach's paintings contain many of Schirmer's principles of composition. In his later paintings, this influence is no longer identifiable. 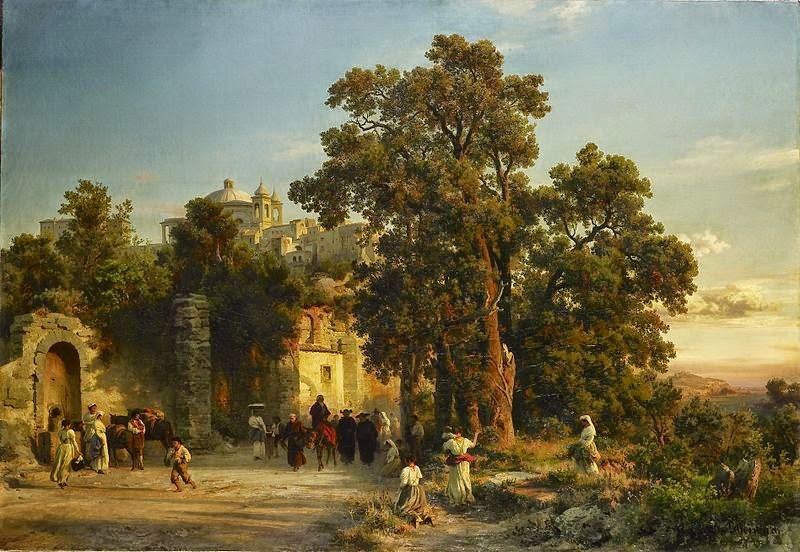 The influence of Schirmer on his early works is likely due to his brother, twelve years older, Andreas Achenbach, who likewise studied at the Düsseldorf Academy. Andreas was a student of Schirmer's and from certain letters it can be concluded that from at least the 1840s Oswald was receiving advice from Andreas about technique and was therefore indirectly influenced by Schirmer's views on painting. 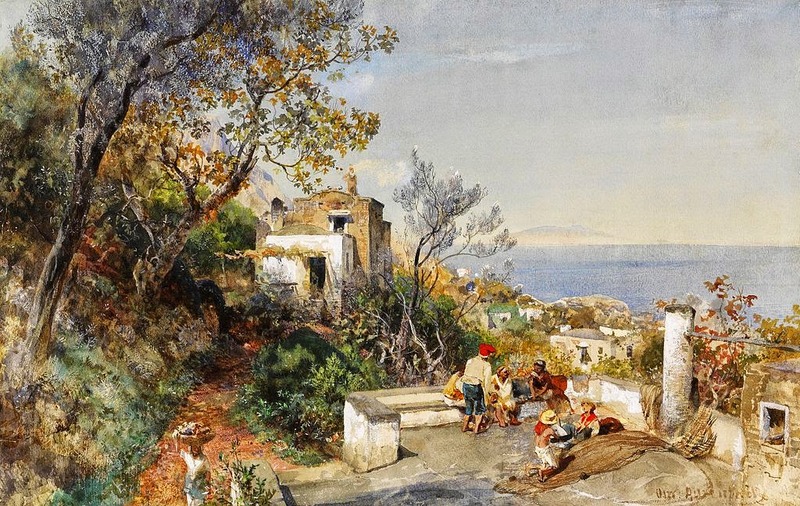 At the heights of their careers, Oswald concentrated on depictions of Italian landscapes while Andreas looked to marine scenes. In their treatment of light and staffage the works of the two brothers resemble each other. 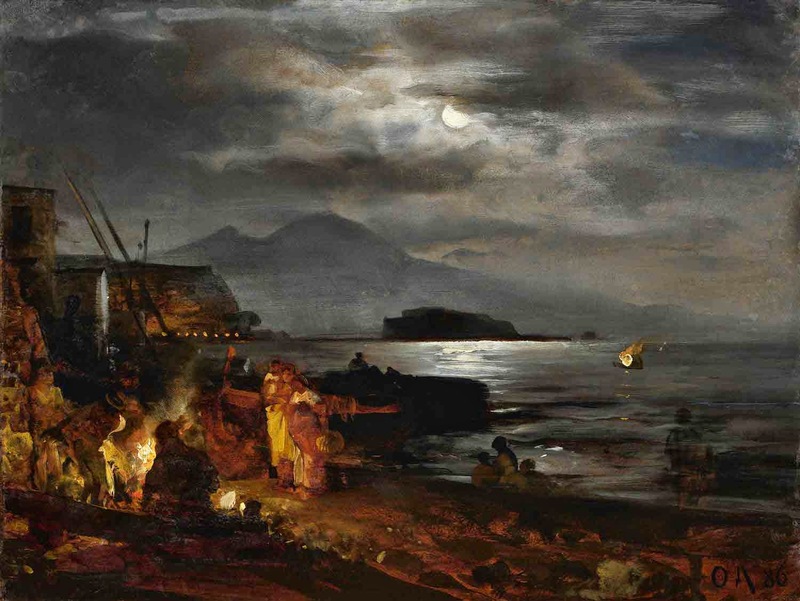 On many occasions, Achenbach recommended British painter J. M. W. Turner as a model. It is possible that he had never seen originals of Turner's work since he never took a trip to England. He probably knew Turner's paintings primarily from the steel engraving prints published in the art books of the time. For Turner, as with Achenbach, light played an important role. Two paintings by Turner, "Mercury and Argus" and "Dogana, and Madonna della Salute, Venice" were already reproduced in prints by 1843. They present landscapes in which individual forms and objects are only loosely depicted. 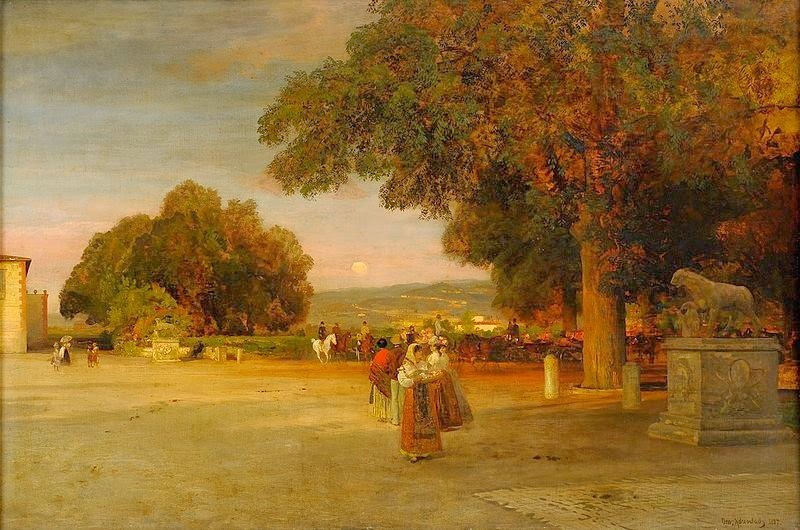 Achenbach was never as radical as Turner but especially in his paintings after 1860 uses a similar painterly style in the depiction of objects. By contrast, Achenbach likely had many opportunities to study the originals of Gustave Courbet's works. Until the Franco-Prussian War from 1870 to 1871, Achenbach was in close contact with the Paris art scene. 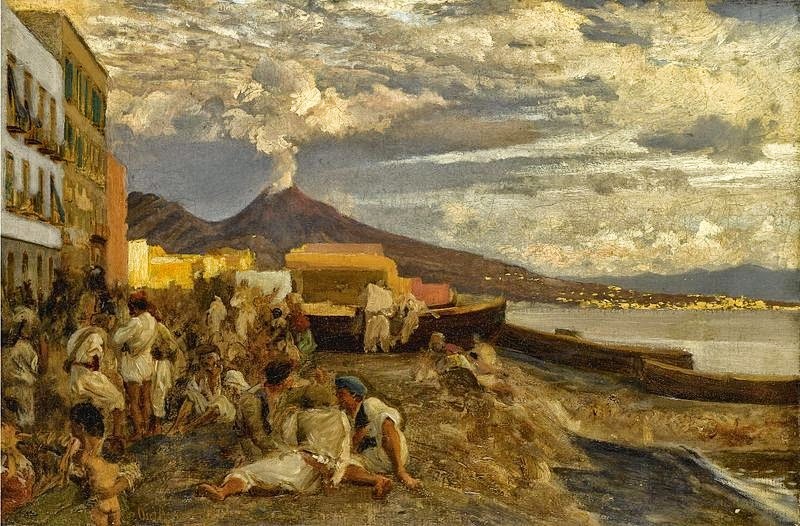 At the Exposition Universelle in Paris in 1855 when Achenbach's paintings were shown, there were also eleven paintings by Courbet on display. Courbet also had forty paintings in the "Pavilion of Realism" at the same time. 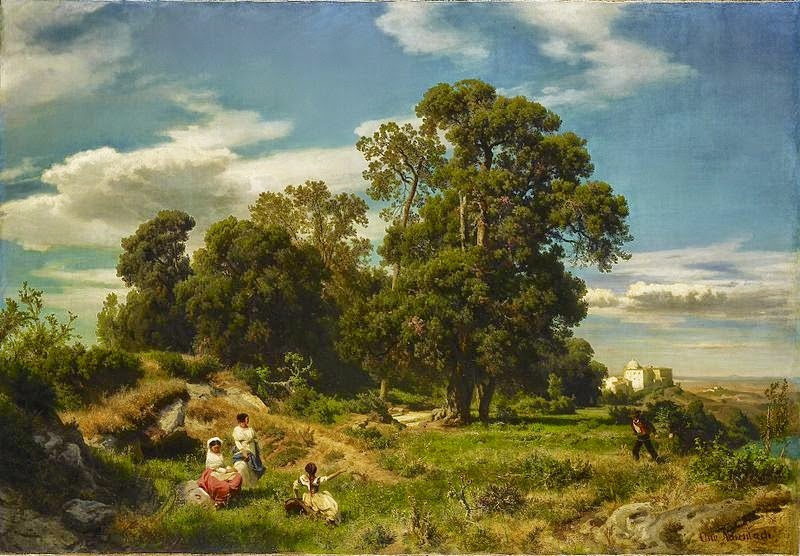 Courbet's radical Realism gained a lot of attention and it is very likely that Achenbach also saw the exhibition of the Frankfurt Art Association from spring 1858 to February 1859 that showed works by Courbet and also the first big Courbet retrospective that ran parallel to the International Exposition of 1867. 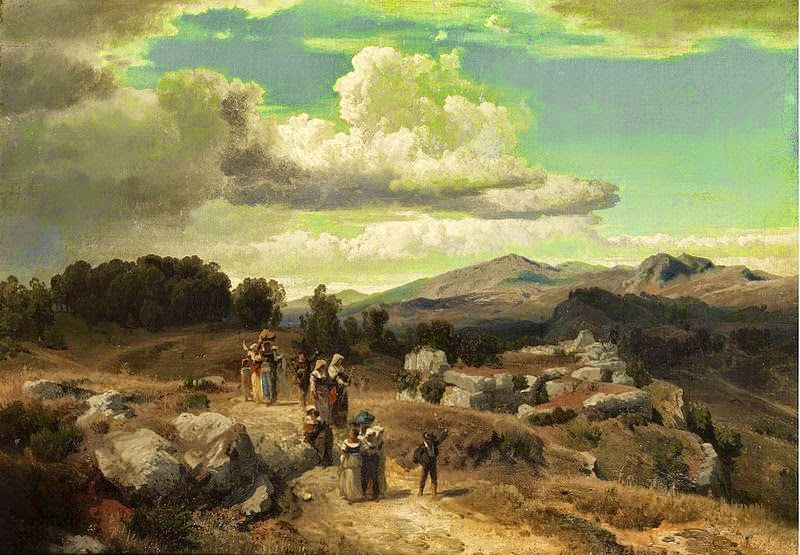 Similar to Courbet, one finds in Achenbach's works often bring together lone elements that differ significantly in distance from the perspective of the painter. 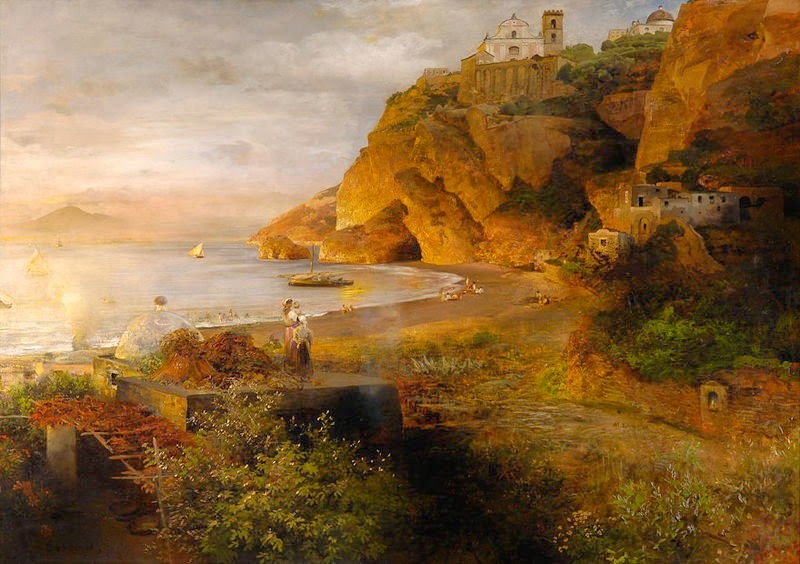 However, while Courbet used a more even surface, Achenbach's painting was more relief-like. 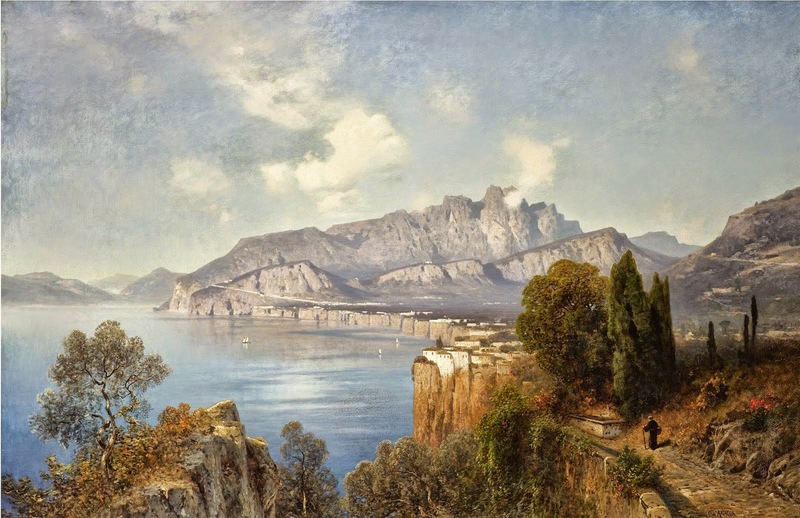 Courbet's radical Realism inspired Achenbach and a number of other German painters. 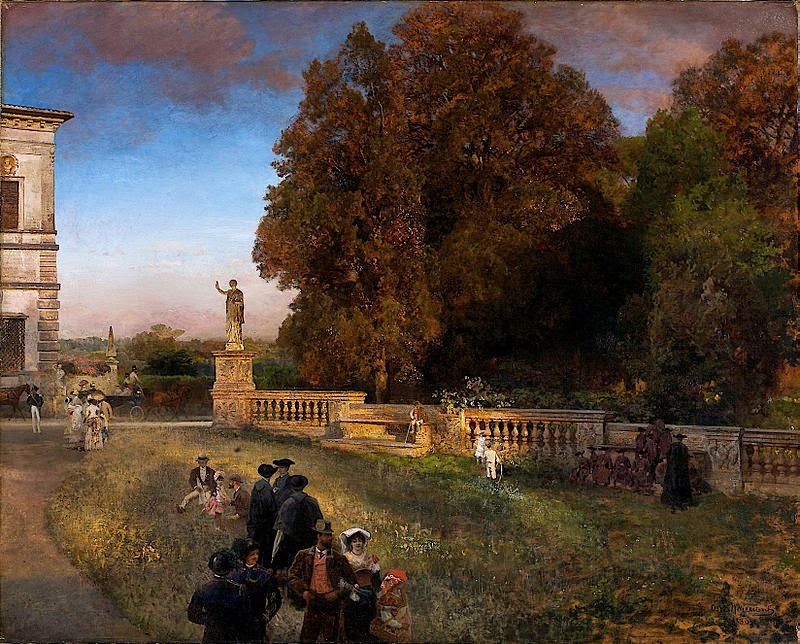 The so-called "Leibl-Circle" (after painter Wilhelm Leibl), including Wilhelm Trübner, Carl Schuch, Johann Sperl and for a while also Hans Thoma had intensely debated Courbet's works among themselves and were inspired to adopt a "pure painting" technique. 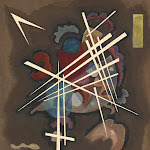 In particular Leibl developed a brushwork technique by which the particular material of the object represented was ignored, thereby already pointing in the direction of abstraction. 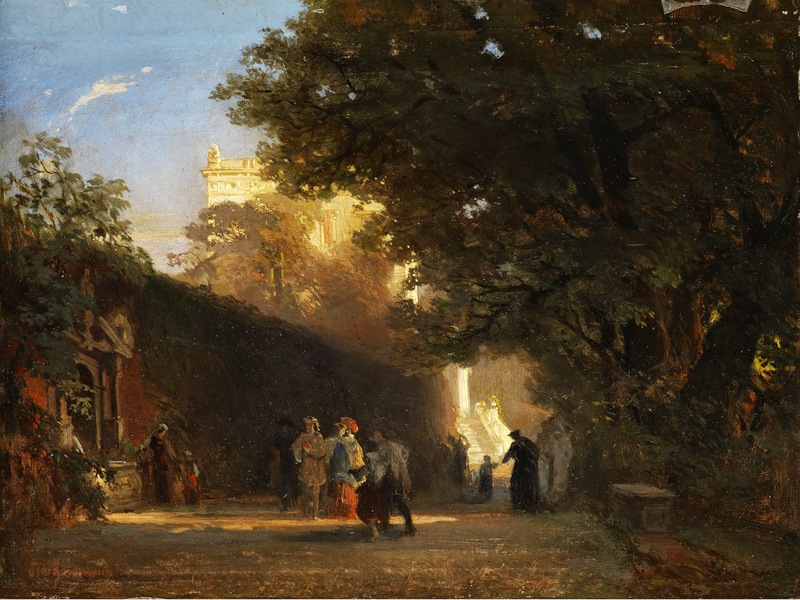 By contrast, Achenbach was radical in his brushwork and application of paint but maintained the formal criteria of traditional composition. This leads to a very different art historical classification of Achenbach. Some see him as an artist who persisted in a fully developed style and for that reason stagnated. 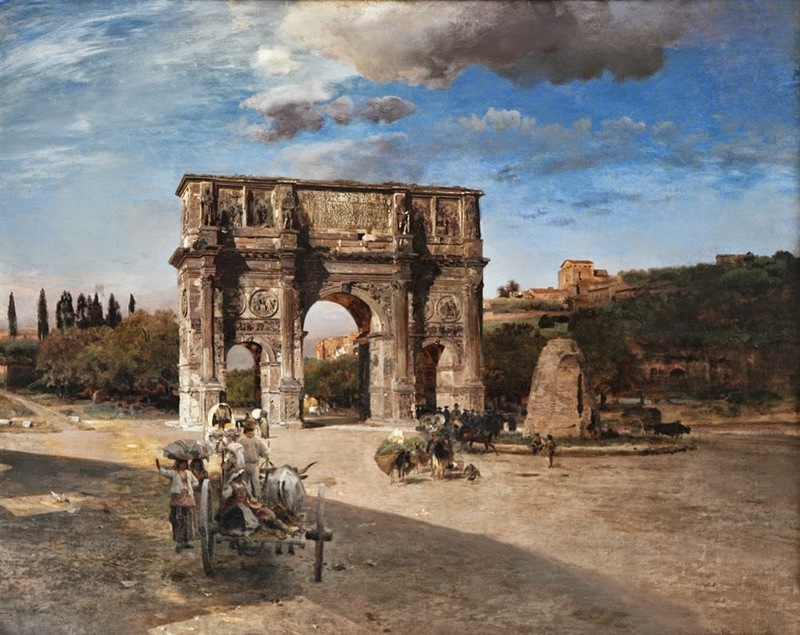 Other art historians cast Achenbach in a mediating role because he presented traditional values in his own style and moved in the direction of modernity. It is undisputed that his early landscapes were pioneering. However, as early as the start of the 20th century, he was seen as a painter who in his later works catered to public tastes and turned into a typical representative of the Gründerzeit period. 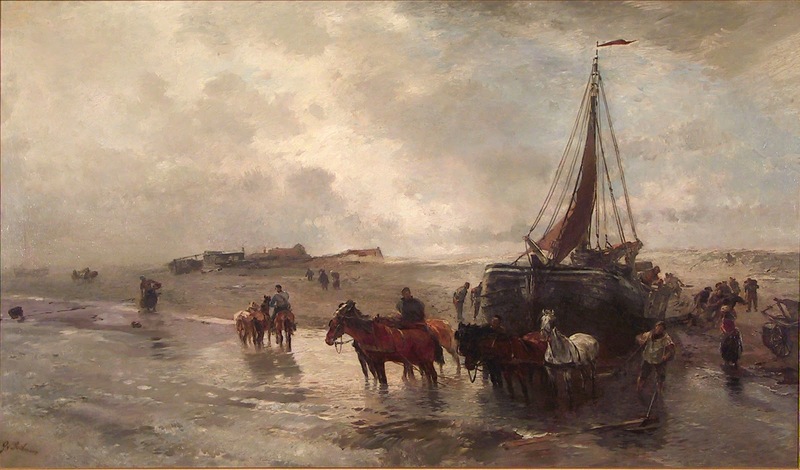 Achenbach's work consists of around 2,000 paintings. Approximately two-thirds are privately owned. His works are in the collections of many museums, mainly in Germany but also across Europe and America including the Musee d'Orsay and the Hermitage in Saint Petersburg. | Chisholm, Hugh, ed. (1911). "Achenbach, Andreas". Encyclopædia Britannica (11th ed.). Cambridge University Press. Oswald Achenbach è stato un pittore Tedesco associato con la scuola di Düsseldorf di pittura. Anche se poco conosciuto oggi, durante la sua vita è stato annoverato tra i più importanti paesaggisti europei. Attraverso le sue attività di insegnamento, ha influenzato la Kunstakademie di Düsseldorf. 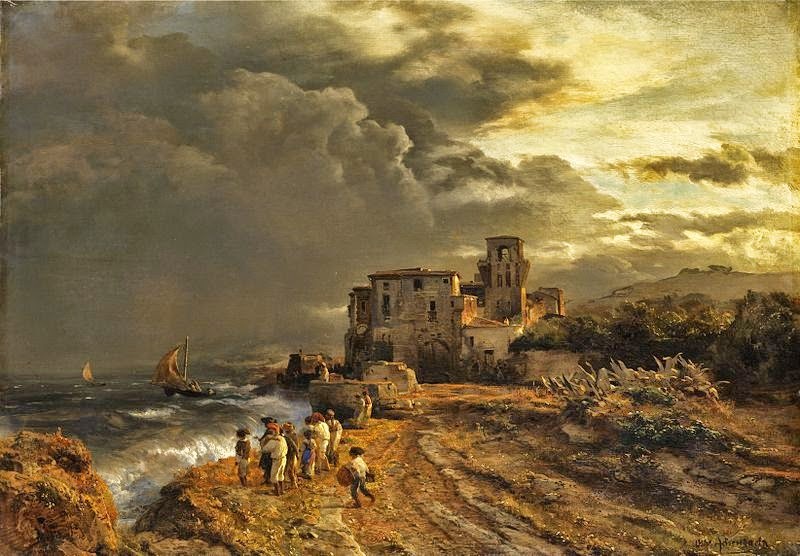 Suo fratello, Andreas Achenbach, che aveva dodici anni più grande, era anche tra i più importanti paesaggisti tedeschi del 19 ° secolo. I due fratelli sono stati chiamati scherzosamente "la A e O di paesaggi". Oswald Achenbach era il quinto di dieci figli. I suoi genitori erano Herman e Christine. C'era poco sulla famiglia per suggerire che avrebbe prodotto due dei più importanti pittori del secolo. Hermann Achenbach è stato impiegato in una serie di posti di lavoro, tra cui la birra e aceto birra, proprietario pensione, e contabile. Durante la prima infanzia di Oswald, la famiglia si trasferì a Monaco di Baviera, dove ha frequentato la scuola primaria per almeno un breve periodo. Esattamente ciò che punto la sua famiglia tornò a Düsseldorf non è noto. Nel 1835, all'età di otto anni, Achenbach è stato iscritto nella classe elementare del Kunstakademie Düsseldorf. Questo era tecnicamente in violazione dello statuto della Academy, che ha richiesto un età minima di dodici anni. Ha continuato fino al 1841. E 'stato uno studente in classe elementare, dove è stato istruito le basi del disegno, e poi trascorso un anno nella classe di architettura. Questo inoltre non corrispondeva al curriculum normale, come descritto nello statuto. Le ragioni per il trattamento di Achenbach non sono completamente noti. Forse, lo statuto erano in pratica semplici linee guida e le eccezioni sono state fatte spesso, o forse solo per gli studenti di grande talento come Achenbach. Inoltre non è chiaro perché Achenbach lasciato l'Accademia nel 1841. Dai suoi quaderni di schizzi, sappiamo che in questo periodo aveva intrapreso gli studi di natura intensiva nella zona intorno Düsseldorf. Nel 1843, la sedicenne Achenbach ha iniziato un viaggio di parecchi mesi attraverso Alta Baviera e Tirolo del Nord, durante il quale ha proseguito gli studi naturalistici. Le sue prime opere note in olio provengono anche da questo periodo. Nel 1845. Achenbach intraprese un viaggio con il suo amico e allievo poi Albert Flamm al nord Italia. I dipinti che Achenbach a termine di questo periodo sono composti prevalentemente da motivi paesaggistici italiani. Pochi dei dipinti di Achenbach da prima del 1850 sopravvivono oggi. Tuttavia, quelli che lo fanno indicano che le sue prime scelte di soggetto e tecnica sono stati pesantemente influenzati dalle idee di essere insegnato nelle accademie d'arte del tempo. L'influenza di Johann Wilhelm Schirmer e Carl Rottman può essere visto in questi dipinti. Negli studi di petrolio che Achenbach completato durante questi viaggi, ha aderito strettamente al paesaggio e si occupa dei dettagli della vegetazione tipica italiana. Motivi architettonici e figure giocano un ruolo molto più piccolo del sarebbe nel suo lavoro più maturo. Fino al 19° secolo, l'educazione artistica in Germania e in gran parte d'Europa è stata fortemente influenzata dal "Kunstakademien" o accademie d'arte. Tuttavia, in particolare nel 19° secolo, le accademie erano diventati estremamente formale e rigida e non erano molto attento alle nuove direzioni artistiche. 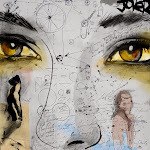 Le accademie anche organizzato le grandi mostre d'arte, attraverso i quali gli artisti vendevano soprattutto il loro lavoro. Gli artisti i cui stili sono opposti alle idee delle accademie non sono state esposte e quindi in generale aveva poche possibilità di vendere il loro lavoro. All'inizio del 19° secolo, i singoli artisti e rappresentanti di interi movimenti artistici hanno cominciato a stare in opposizione alla cultura e concetti delle Accademie. 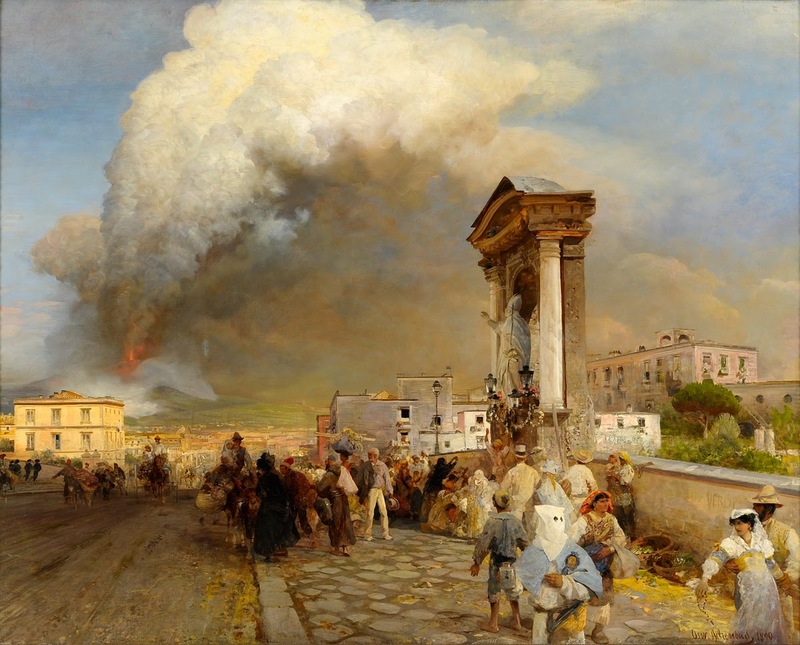 Achenbach è stato uno degli artisti che si sono opposti alla Kunstakademie di Düsseldorf e divenne uno dei primi membri di due associazioni di Düsseldorf, che molti artisti come mentalità si erano uniti. Il primo è stato l '"Associazione di Düsseldorf artisti per sostegno reciproco e Aiuto" e l'associazione "Malkasten", che è stata fondata il 11 agosto 1848 Achenbach come uno dei firmatari originari del documento fondazione. Queste associazioni hanno organizzato congiuntamente teatrali, organizzate serate di musica e mettere su mostre. A molti eventi, Achenbach ha partecipato attivamente, dirigere, riproduzione o mettere in scena opere teatrali. Achenbach era particolarmente attaccato alla "Malkasten" e rimasto connesso con essa fino alla fine della sua vita. Nel 1850, i suoi quadri sono stati esposti in mostre della galleria di Düsseldorf appena fondata di Eduard Schulte. 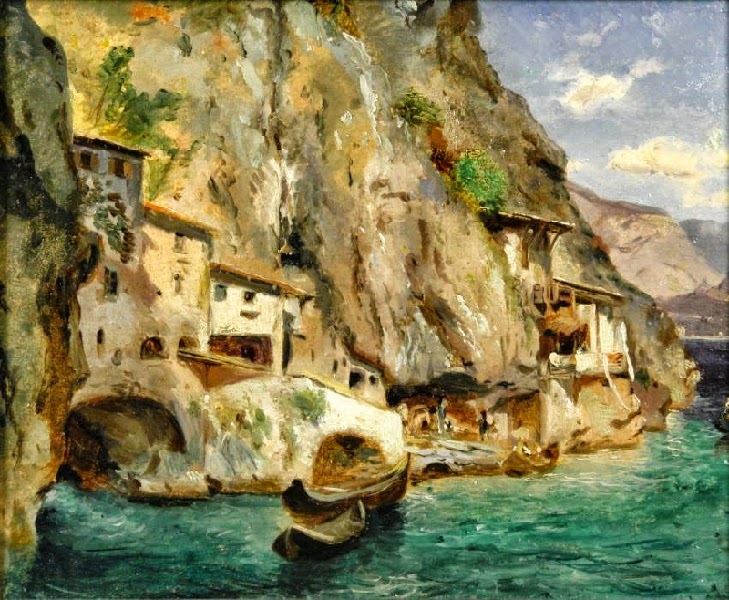 Galleria di Schulte ha mostrato le opere di artisti che erano indipendenti dalla Academy e ha giocato un ruolo importante nei primi mesi del successo economico di Achenbach. Si è sviluppato in una delle più importanti gallerie tedesche e le filiali in seguito stabilite a Berlino e Colonia. 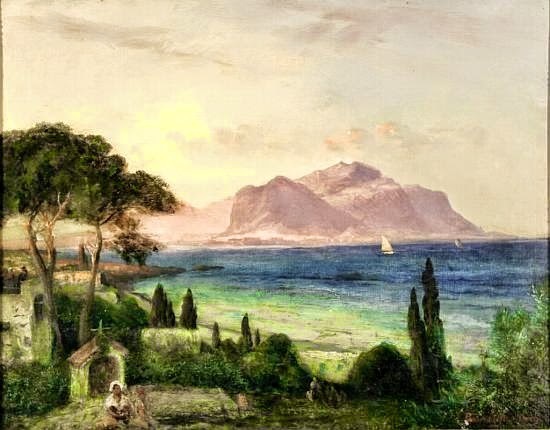 Nell'estate del 1850, Achenbach ha intrapreso un viaggio in Italia, tra cui Nizza, Genova e Roma. Insieme ad Albert Flamm, ha viaggiato da Roma nella campagna circostante e ha visitato le aree in cui erano stati ispirati precedenti paesaggisti. 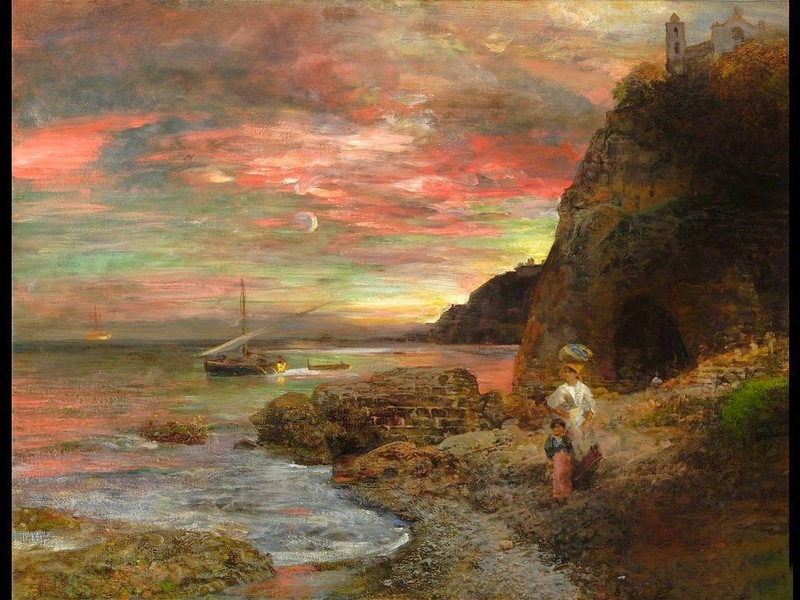 Durante il viaggio ha avuto modo di conoscere un certo numero di altri pittori migliori, tra cui Arnold Böcklin, Ludwig Thiersch, e Heinrich Dreber con il quale ha trascorso un lungo periodo in Olevano. 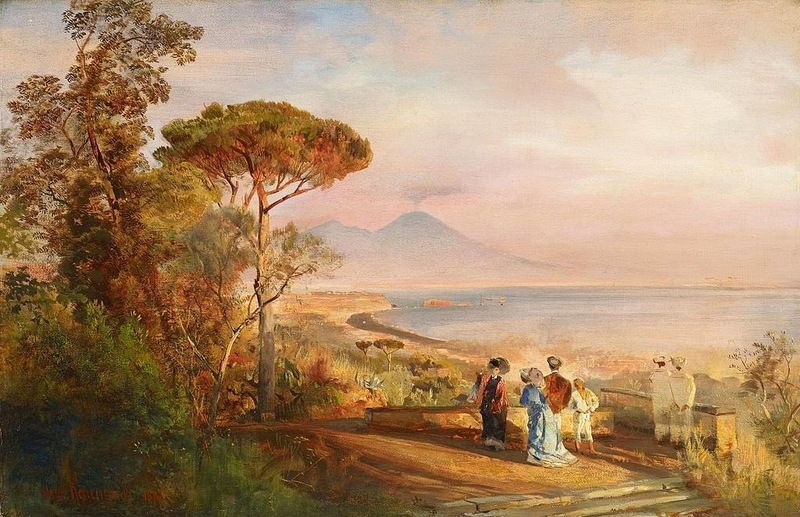 Thiersch volta commentato quanto diversamente gli artisti trattati loro impressioni dei paesaggi: Dreber ha elaborati schizzi a matita, Böcklin semplicemente lasciò sperimentare l'ambiente e registrati relativamente poco nel suo taccuino, mentre Achenbach e Flamm entrambi verniciati studi ad olio. Studi superstiti di Achenbach dimostrano che non era troppo interessato ai dettagli, ma concentrato sui colori e le forme caratteristiche e la distribuzione di luce e ombra. Si è concentrato sulle sue impressioni a colori, impostando strati di vernice in diversi spessori oltre l'un l'altro per trovare il tono desiderato. Il 3 maggio 1851, Achenbach sposato Julie Arnz, al quale era stato impegnato dal 1848. Era la figlia di un editore Düsseldorf, che ha pubblicato, tra gli altri periodici, Düsseldorf Monathefte e Düsseldorf Monatsalbum. 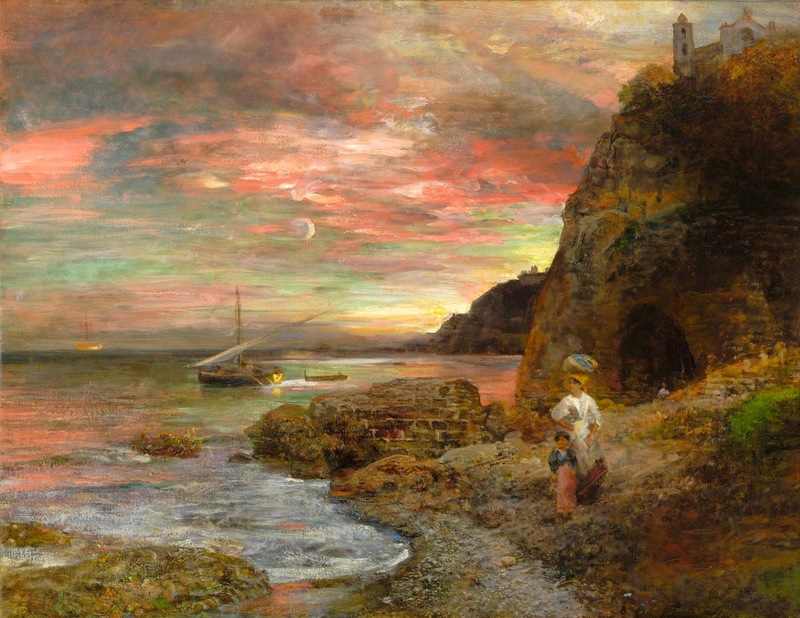 Achenbach ha contribuito a entrambi questi con litografie dei suoi dipinti, schizzi e altre opere. Allo stesso tempo, ha iniziato a muovere i primi studenti. Tra il 1852-1857 la coppia ha avuto quattro figlie, seguito da un figlio nel 1861. Il figlio di Achenbach, Benno von Achenbach, sarebbe un importante innovatore nello sport equestre di Attacchi e fu nobilitata per i suoi contributi ad essa da Wilhelm II. A questo punto, la pittura di Achenbach era già ben noto a livello internazionale. Nel 1852, a 25 anni, l'Accademia di Belle Arti di Amsterdam lo aveva ammesso come membro. 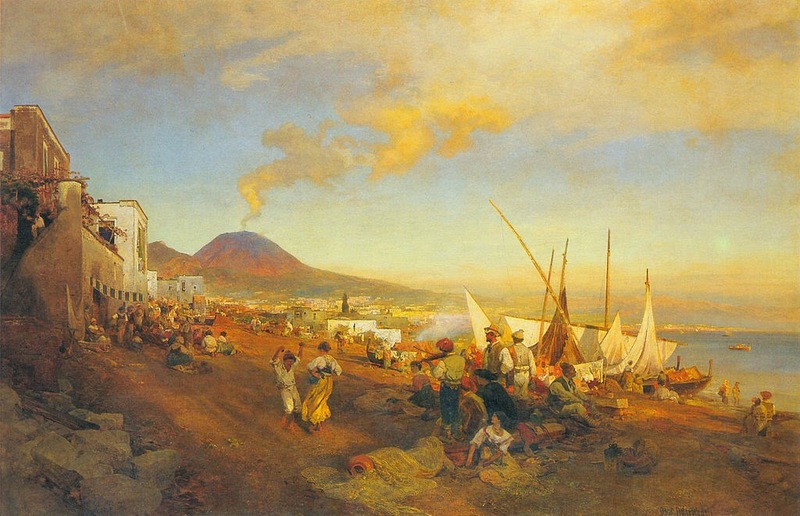 Molte delle sue opere sono state esposte alla Exposition Universelle del 1855 e sono stati molto ben accolti. Nel 1859, è stato onorato con una medaglia d'oro all'Esposizione Salon di Parigi. Nel 1861 è stato concesso un membro onorario della St Petersburg Academy e nel 1862 presso l'Accademia d'Arte di Rotterdam. Dopo il 1860, la sua tecnica ha subito un cambiamento in quello che è considerato il suo stile maturo. I dipinti erano più tattile, la vernice è stata applicata con maggiore consistenza e le pennellate erano meno dipendente materia oggetto rappresentato. In parti di alcuni dipinti, Achenbach sempre a meno cifre dettagliate. Questo cambiamento di tecnica può avere a che fare con l'influenza di Gustave Courbet. I suoi soggetti preferiti continuano ad essere i paesaggi italiani e scene contadine, che ha valorizzato e idealizzato con la sua illuminazione. 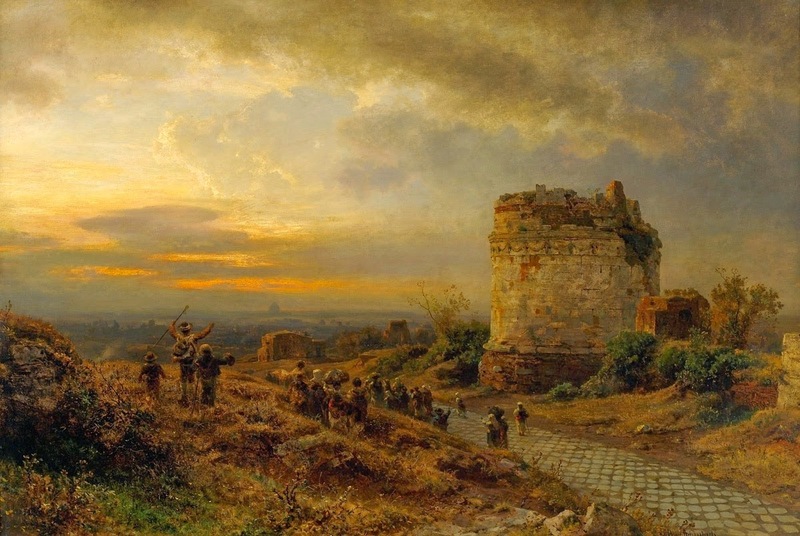 Nel mese di marzo 1863 Achenbach divenne professore di pittura di paesaggio alla Kunstakademie di Düsseldorf. Accettare rappresentava una elevazione sociale e anche la sicurezza finanziaria. Sembra anche di essere in contraddizione con la sua precedente opposizione. Tuttavia, dal momento che Friedrich Wilhelm Schadow aveva lasciato la carica di direttore nel 1859, i conflitti sia all'interno dell'Accademia e anche tra l'Accademia e gli artisti indipendenti sono diminuite. La nomina di Achenbach di una posizione è stata una decisione politica consapevole che riflette la nuova direzione dell'Accademia di Düsseldorf, per giungere ad una conciliazione con gli artisti indipendenti. Nello stesso anno, Achenbach è stato nominato Cavaliere della Legion d'Onore da Napoleone III e 1863-1868 suoi pittori sono stati mostrati al Salon di Parigi. Accanto l'Ordine di Guadalupe dall'imperatore Massimiliano I del Messico i 1866 e la Croce dei Cavalieri, First Class dall'Ordine di San Michele dalla giuria per l'Esposizione Internazionale d'Arte di Monaco di Baviera nel 1869, questo è stato tra i più grandi onori Hof sua carriera. Tale riconoscimento per gli artisti in questo periodo non era raro, ma hanno contribuito in modo significativo alla fama di Achenbach, ha confermato il suo riconoscimento come artista e sono stati importanti per il suo successo commerciale. Dopo il 1866 ha insegnato uno dei altamente considerato "Master Classes". 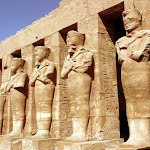 Tra i suoi allievi più noti sono Gregor von Bochmann, Arthur Calame, Temistocle von Eckenbrecher, Arnold Forstmann, Theodor Hagen, Louis Kolitz, Ascan Lutteroth, e Karl Seibels. Per i suoi studenti, ha sottolineato soprattutto il ruolo decisivo di luce e buio per la composizione dei dipinti. Per lui era più importante la scelta del soggetto. Di conseguenza, ha consigliato i suoi studenti di familiarizzare con i dipinti di JMW Turner. Ci ha anche consigliato le opere del fratello Andreas. 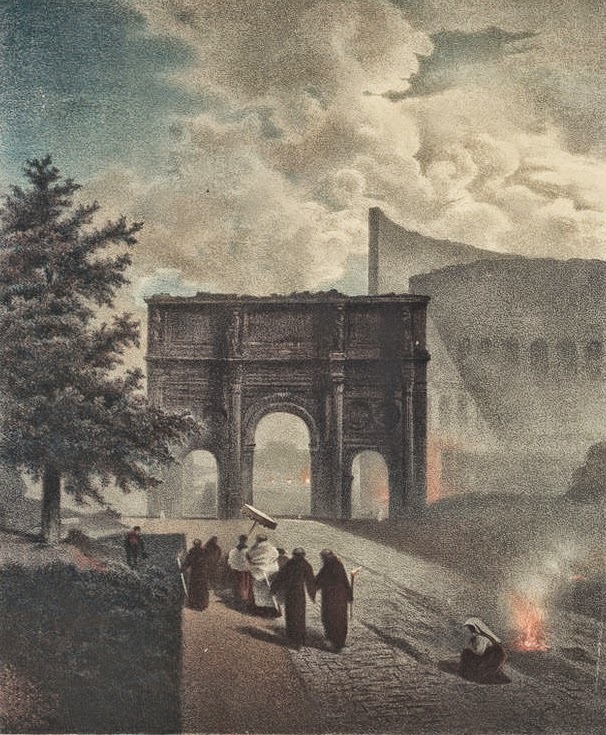 Durante la sua cattedra, Achenbach ha continuato ad intraprendere molti viaggi. Questi lunghi soggiorni compresi nella foresta di Teutoburgo e Svizzera. Nel 1871 lui e la sua famiglia ha trascorso quasi nove mesi in Italia, tra Castellammare di Stabia, Amalfi, Capri e Ischia, e diverse settimane in Sorrento. Durante questo periodo Theodor Hagen e Albert Flamm ha preso il suo posto presso l'Accademia. Dopo il 1860, la sua tecnica ha subito un cambiamento. I dipinti erano più tattile, la vernice è stata applicata con maggiore consistenza e le pennellate erano meno dipendente materia oggetto rappresentato. In parti di alcuni dipinti, Achenbach sempre a meno cifre dettagliate. Questo cambiamento di tecnica può avere a che fare con l'influenza di Gustave Courbet. I suoi soggetti preferiti continuano ad essere i paesaggi italiani e scene contadine, che ha valorizzato e idealizzato con la sua illuminazione. 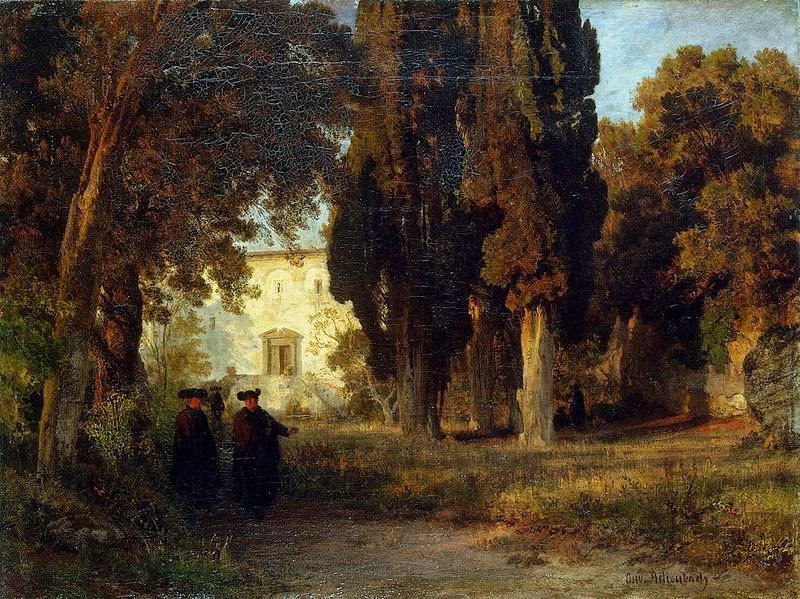 Achenbach ha dato la sua cattedra all'Istituto nel 1872. Egli aveva presentato le sue dimissioni una volta, nel 1869, ma lo ritirò. 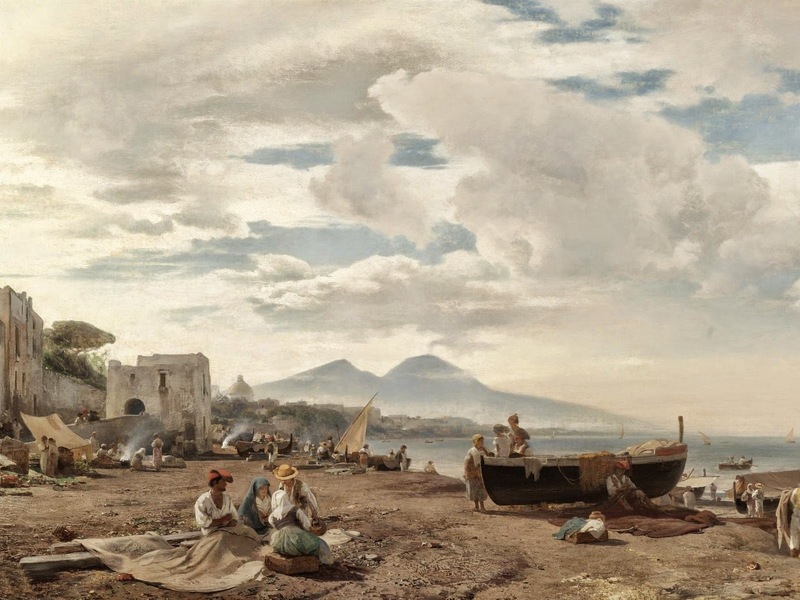 Achenbach aveva sentito che il suo insegnamento costretto il proprio lavoro artistico. Negli anni successivi, Achenbach ha fatto numerosi viaggi. L'ultimo grande viaggio in Italia è iniziata all'inizio dell'estate 1882 e ha visitato Firenze, Roma, Napoli e Sorrento. Nel 1884 e il 1895 ha preso viaggi in Nord Italia. Aveva programmato un viaggio nel 1897 a Firenze, ma annullato a causa di malattia. Nel 1897 Achenbach è stato fatto cittadino onorario di Düsseldorf in riconoscimento dei suoi oltre 50 anni di impegno in varie istituzioni e associazioni Düsseldorf. Per molti anni era stato una delle personalità più importanti della città. Questa elevata posizione sociale aveva coinvolto anche un grande e ostentata casa dove ha ospitato artisti, scrittori, studiosi, ufficiali militari e membri della nobiltà. Tra i suoi clienti più importanti e mecenati era Karl Anton, Principe di Hohenzollern. Esecuzione di una tale famiglia era costoso e ha richiesto Achenbach per produrre molti dipinti. Come un artista ben noto, è stato facile per lui trovare acquirenti. Il maggior numero di suoi dipinti, ha portato a ripetizioni in oggetto e motivi. Già nel 1860 recensori lo hanno accusato di "pittura a morte" certi argomenti. Come nei suoi studi di petrolio nel 1850, nella sua successiva opere Achenbach costruito colori fino additivo, usando il pennello, spatola, e le sue dita. Ha usato anche la texture della tela, come un elemento di design. In alcune opere, le superfici che vengono uniformemente e accuratamente dipinti con un pennello fine stare vicino ai luoghi dove la superficie del dipinto mostra attraverso o la vernice è freschissima, dando alcune opere una struttura decisamente notevole. Un'altra caratteristica della tarda di Achenbach è che il livello di dettaglio non decreat continuamente con la prospettiva, ma riflette piuttosto i suoi scopi per l'effetto complessivo del dipinto. Inoltre, mentre i suoi primi dipinti, i colori sono stati soggiogati e dominati dal tono generale, nelle opere successive, contrasti accentuati giocano un ruolo importante. Infine, colori pastello diventano più comuni nei suoi dipinti dalla metà del 1880, mentre nei suoi primi lavori, i toni Browner dominato. Achenbach morì a Düsseldorf il 1 ° febbraio 1905, il giorno prima del suo 78 ° compleanno. Fu sepolto nel cimitero nord di Düsseldorf, dove è la tomba è conservata fino ad oggi. Durante la sua educazione, Achenbach è mai stato in realtà un allievo di Johann Wilhelm Schirmer. Tuttavia, ha un artista che ha trascorso la maggior parte della sua vita a Düsseldorf, ha comunque avuto molte opportunità di studiare i suoi quadri. Nei dipinti di Achenbach dal 1840 e nei primi anni 1850, i quadri di Achenbach contengono molti dei principi di Schirmer di composizione. Nei suoi dipinti più tardi, questa influenza non è più identificabile. L'influenza di Schirmer sui suoi primi lavori è probabilmente dovuto al fratello, dodici anni più, Andreas Achenbach, che pure ha studiato presso l'Accademia di Düsseldorf. Andreas era uno studente di Schirmer di e da alcune lettere si può concludere che dal almeno 1840 Oswald stava ricevendo consigli da Andreas sulla tecnica e, pertanto, è stato indirettamente influenzato dalle idee di Schirmer sulla pittura. 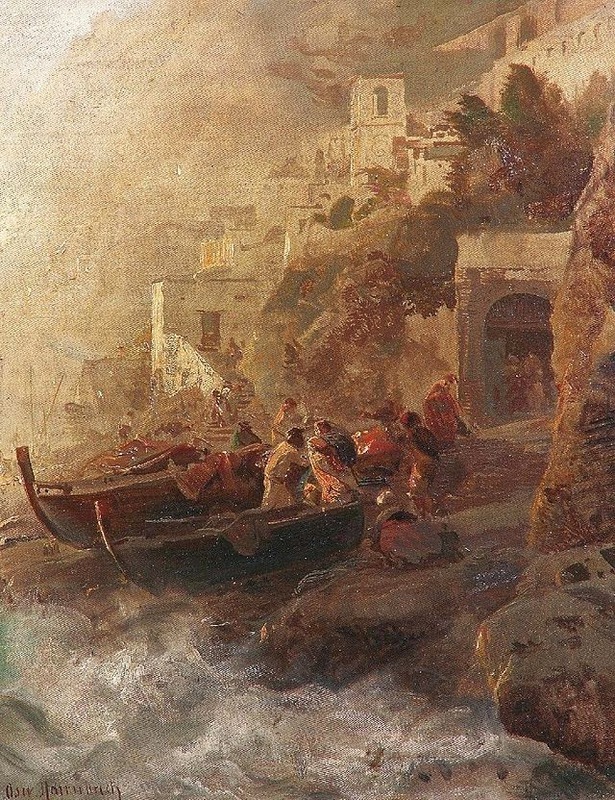 Alle altezze della loro carriera, Oswald concentrata su raffigurazioni di paesaggi italiani, mentre Andreas sembrava scene marine. Nella loro trattamento della luce e staffage le opere dei due fratelli si assomigliano. In molte occasioni, Achenbach raccomanda inglese pittore JMW Turner come modello. E 'possibile che non aveva mai visto gli originali del lavoro di Turner da quando ha mai preso un viaggio in Inghilterra. Probabilmente sapeva dipinti di Turner principalmente dalle incisioni stampe acciaio pubblicati nei libri d'arte del tempo. 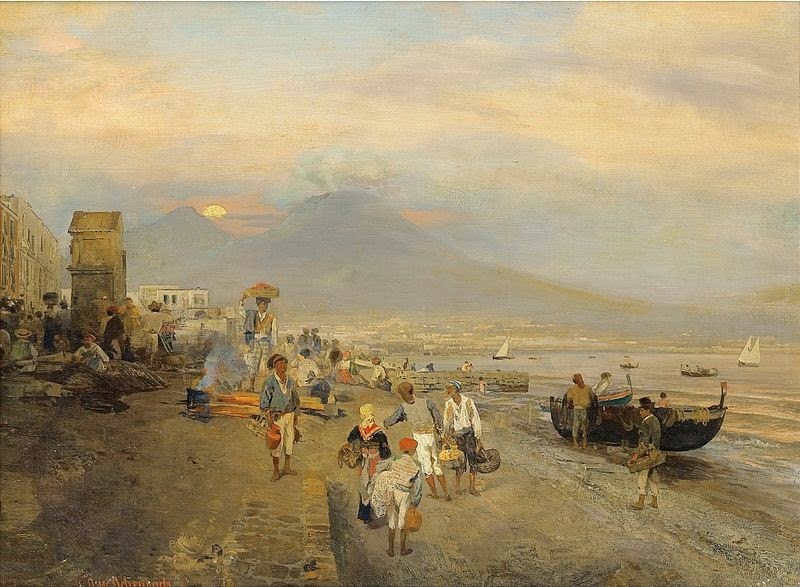 Per Turner, come con Achenbach, la luce gioca un ruolo importante. Due dipinti di Turner, "Mercury e Argus" e "Dogana, e Madonna della Salute, Venezia" sono stati già riprodotti in stampe dal 1843. Essi presentano paesaggi in cui le singole forme e gli oggetti sono solo vagamente raffigurati. 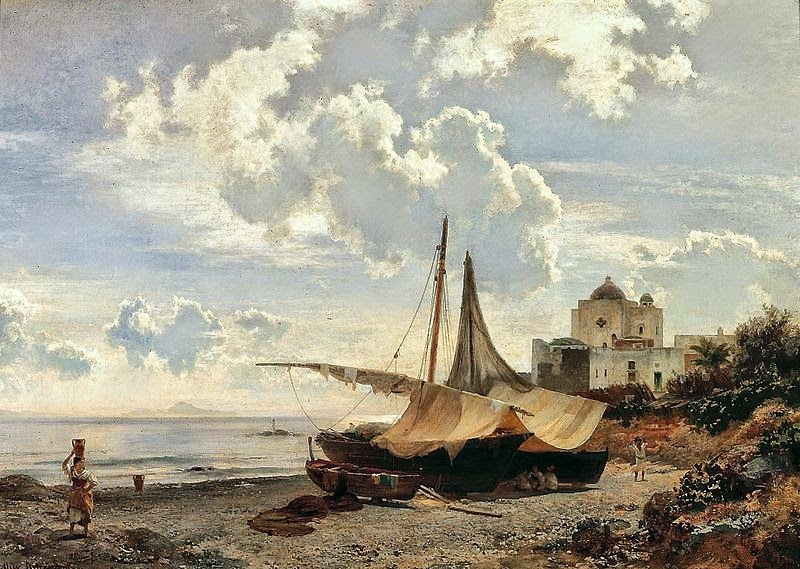 Achenbach è mai stato così radicale come Turner, ma soprattutto nei suoi dipinti dopo il 1860 usa uno stile pittorico simile nella raffigurazione di oggetti. 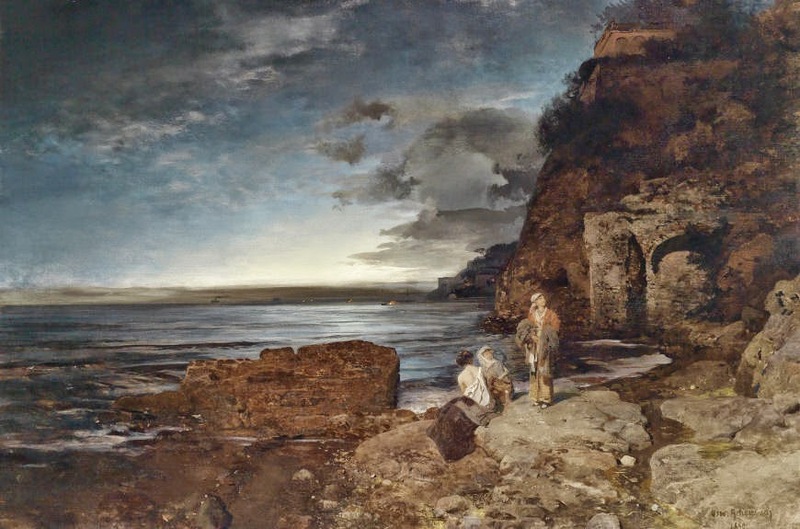 Al contrario, Achenbach probabilmente aveva avuto molte opportunità di studiare gli originali delle opere di Gustave Courbet. 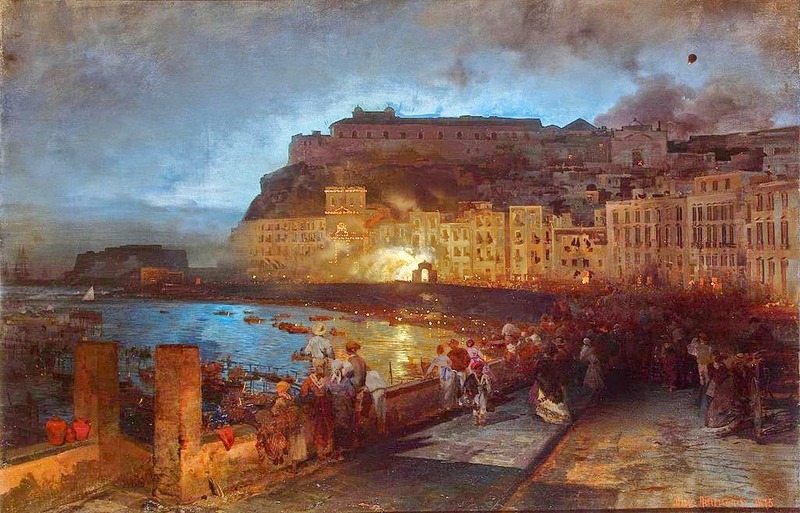 Fino alla guerra Franco Prussiana 1870-1871, Achenbach era in stretto contatto con la scena artistica di Parigi. 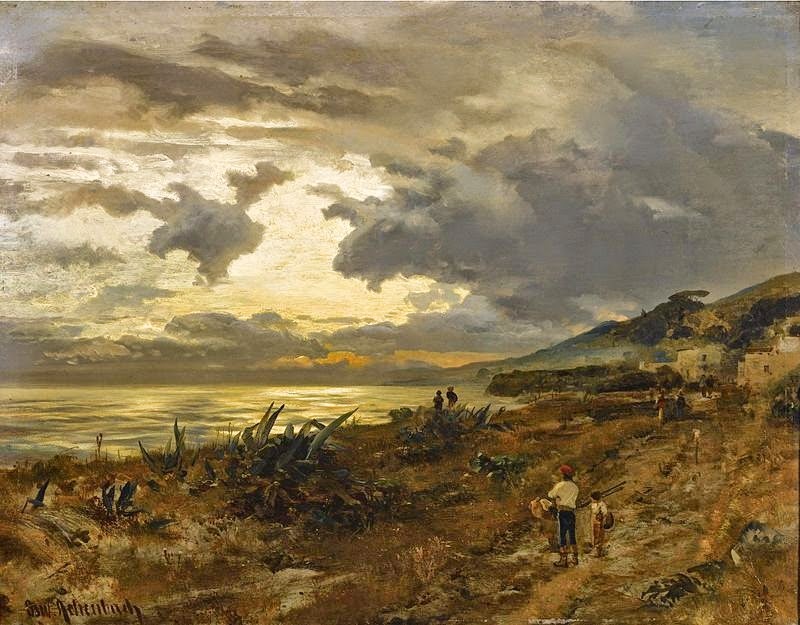 Alla Exposition Universelle di Parigi del 1855, quando sono stati mostrati dipinti di Achenbach, ci sono stati anche dipinti undici di Courbet in mostra. Courbet ha avuto quaranta dipinti nel "Padiglione del Realismo" allo stesso tempo. 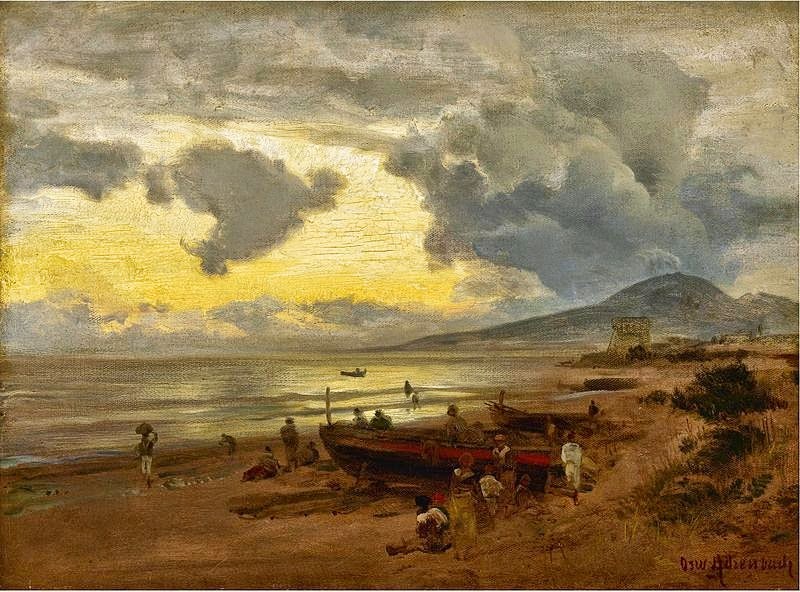 Realismo radicale di Courbet ha guadagnato un sacco di attenzione, ed è molto probabile che Achenbach ha visto anche la mostra della Art Association di Francoforte a partire dalla primavera 1858 al febbraio 1859 che ha mostrato le opere di Courbet e anche la prima grande retrospettiva Courbet che correva parallela alla Esposizione Internazionale di 1867. Simile a Courbet, si trova nelle opere di Achenbach spesso portano elementi insieme solitari che differiscono significativamente in piedi dal punto di vista del pittore. Tuttavia, mentre Courbet utilizzato una più uniforme la superficie, la pittura di Achenbach era più sollievo simile. Il Realismo radicale di Courbet ha ispirato Achenbach ed una serie di altri pittori tedeschi. La cosiddetta "Leibl Circle", tra cui Wilhelm Trübner, Carl Schuch, Johann Sperl e per un po 'anche Hans Thoma aveva intensamente dibattuto opere di Courbet tra di loro e sono stati ispirati ad adottare una tecnica di "pittura pura". In particolare Leibl sviluppato una tecnica pennellata con cui il particolare materiale dell'oggetto rappresentato è stato ignorato, così già che punta nella direzione di astrazione. Al contrario, Achenbach era radicale nella sua pennellata e l'applicazione di vernice ma ha mantenuto i criteri formali di composizione tradizionale. Questo porta ad una diversa classificazione storica dell'arte Achenbach. Alcuni lo vedono come un artista che si ostinava a uno stile completamente sviluppato e per questo motivo una stagnazione. 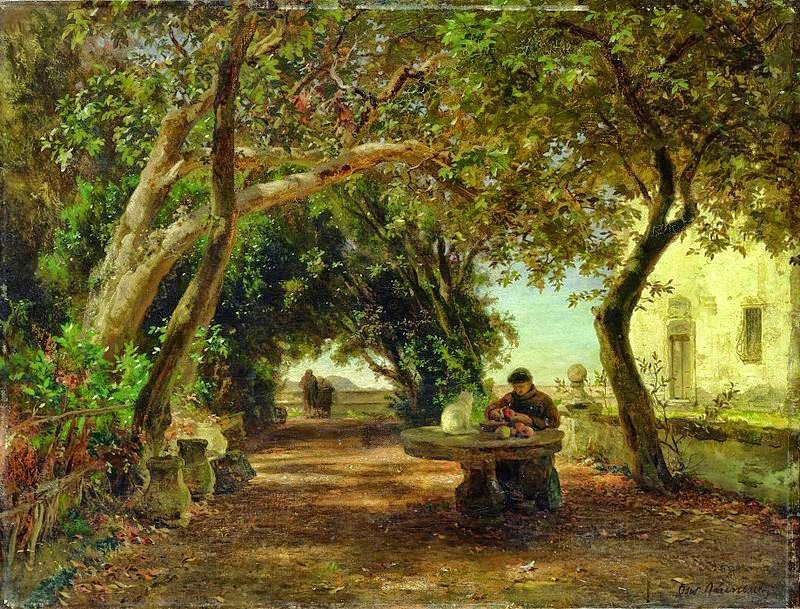 Altri storici dell'arte gettato Achenbach in un ruolo di mediazione, perché ha presentato valori tradizionali nel suo stile e si è trasferito in direzione della modernità. E' pacifico che i suoi primi paesaggi erano all'avanguardia. Tuttavia, già a partire dall'inizio del 20° secolo, è stato visto come un pittore che nelle sue opere successive adatta a gusti del pubblico e trasformato in un tipico rappresentante del periodo Gründerzeit. Il lavoro di Achenbach è costituito da circa 2.000 dipinti. Circa due terzi sono di proprietà privata. Le sue opere sono presenti nelle collezioni di molti musei, soprattutto in Germania, ma anche in tutta Europa e in America tra cui il Museo d'Orsay e l'Hermitage di San Pietroburgo. | Chisholm, Hugh, ed. (1911). 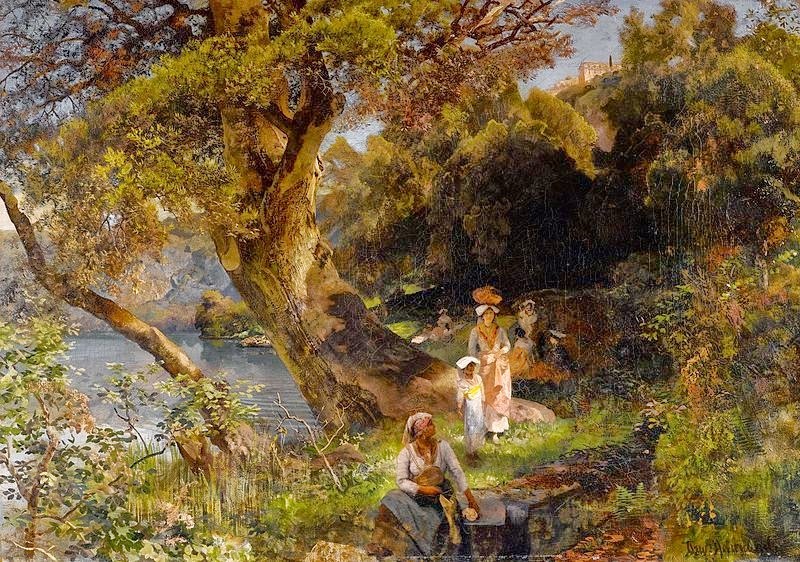 "Achenbach, Andreas". Encyclopædia Britannica (11th ed.). Cambridge University Press.